Excerpted from “How the PLA Fights: Weapons and Tactics of the People’s Liberation Army” published by the United States Army’s Training and Doctrine Command. Additions and updates by Dr Carlo Kopp and Dr Martin Andrew. With the operational art of the PLA now firmly rooted in the concepts and doctrine of modular forces creating independent battle groups within the division, augmenting it seamlessly with heavier forces. Battle groups are generally based around a battalion and the PLA is going towards a three-level command structure of corps, brigade and battalion. The divisional structure remains for administration in many military regions containing brigades instead of regiments to accommodate the battle group concept. The idea behind brigade and battle groups is to ‘adapt to informationalised warfare and to enable more rapid decision making on the battlefield’. In the PLA, the primary difference between a regiment and a brigade is that the brigade is capable of independent operations whereas a regiment is directly subordinate to the division, as it does not have the headquarters staff to carry out independent operations. The People’s Liberation Army’s 112th Mechanised Infantry Division was the first unit using the new structure and when unveiled in 2006 is claimed by the PLA to be two generations ahead of its predecessor. The division is organised and equipped to fight as independent battle groups on mountainous and urban terrain, its equipment being lighter in weight and firepower than those of the PLA’s divisions tasked to defend the nation against aggressors equipped with main battle tanks. 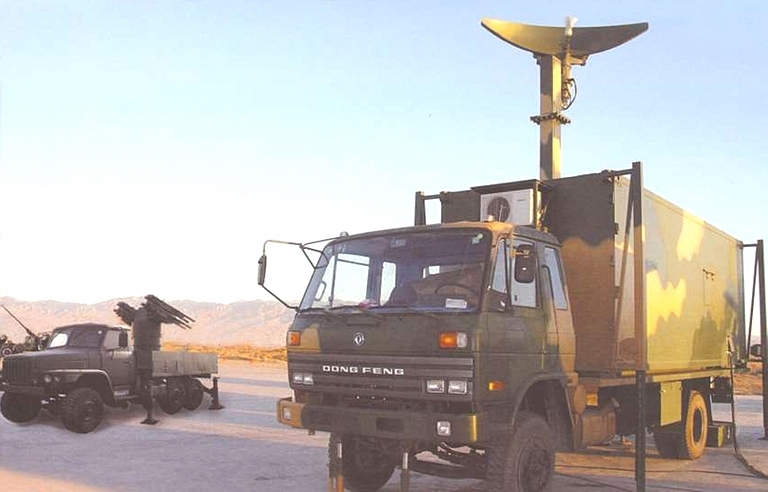 Its theatres of operation are Xinjiang and Tibet where the division’s lighter vehicles and support weapons can operate in areas where the communications infrastructure can be described as poor at best. There are three mechanized infantry companies to the battalion and three battalions to the brigade with three brigades in the division giving a total of 351 Type 86 infantry fighting vehicles (IFVs). These are supported by an artillery brigade of 72 PLZ89 122mm self-propelled guns and a tank battalion of 99 Type 96 main battle tanks. Type 89 armoured command vehicles are liberally provided throughout the division down to the company level to provide command and control. Intelligence and electronic warfare assets are held at the divisional level in a battalion and distributed as required. Although described as a light division the PLA generally classes wheeled units as light and tracked units as heavy. The new mechanised infantry brigade has four mechanised infantry battalions, one armoured battalion, one fire support battalion, one engineer battalion and one communication battalion. Each mechanised infantry battalion has three mechanised infantry companies, each of three platoons with each company having 13 infantry fighting vehicles; four in each platoon and one headquarters vehicle. Each armoured brigade has three armoured battalions for a total of 99 main battle tanks, one mechanised infantry battalion, one artillery battalion with 18 self-propelled guns and one air defence battalion of 18 AAA guns. Each armoured battalion has three armoured companies, each of three platoons with each company having 11 main battle tanks; three in each platoon and two headquarters vehicles. There are no tanks at the battalion or brigade headquarters. A complete armoured brigade contains 2,200 soldiers. 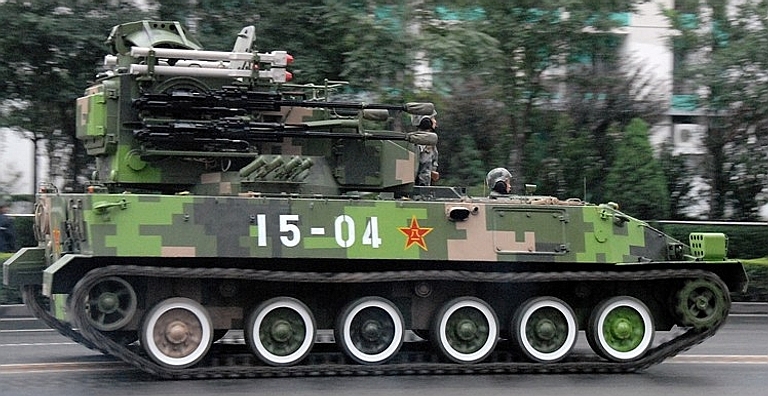 The Type 86 infantry fighting vehicle, a Chinese copy of the Russian BMP-1, is being updated by replacing its existing 73mm low velocity gun turret with the new Chinese one man ‘universal turret’ containing a 30mm chain gun which has impressive performance against light armour, can disable many main battle tanks, and can be used in an anti-helicopter role. 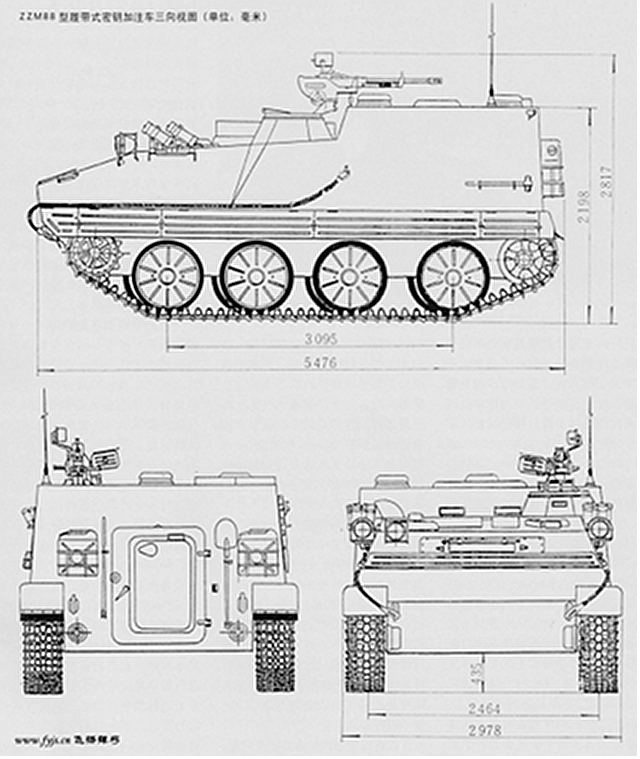 The other combat tracked vehicles in the division, other than the tanks, are based on the indigenous Type 89 armoured fighting vehicles. 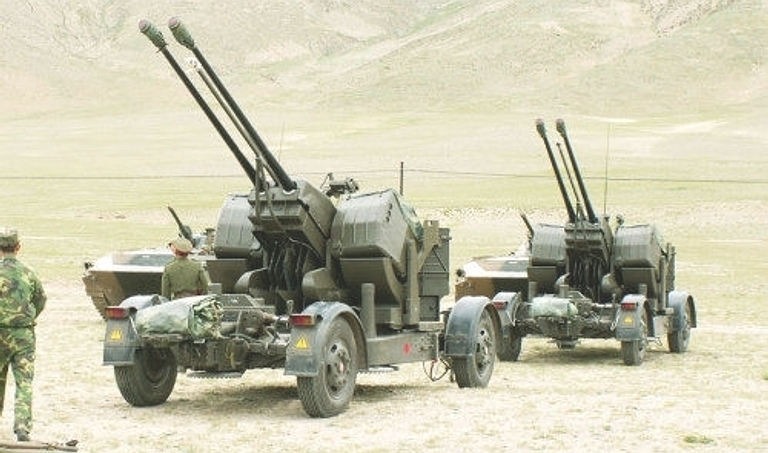 The support company of the battalion comprises one 100mm mortar company of 10 vehicles with one mortar per vehicle and a fire control vehicle, an automatic grenade launcher (AGL) platoon in two vehicles with two AGLs each; one anti-tank platoon in two vehicles sharing three anti-tank guided missile systems, normally the Hong Jian 8. There are a total of 18 Type 89 series armoured vehicles in each brigade providing 54 anti-tank guided missile systems in the division. The wheeled units are equipped with the WZZ551 family of vehicles. In 1990 the first vehicle was introduced into service as the Type 90 (WZ551A) IFV was equipped with turreted 25mm automatic cannon, and in 1992 the Type 92 (WZ 551B) was introduced as a cheaper APC with the semi-open turret used on the ZSD89 APC. 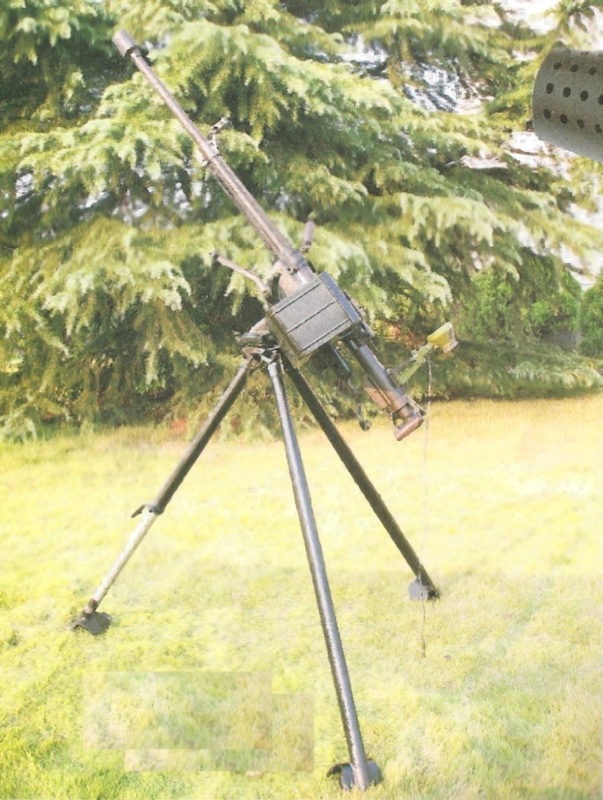 The WZ551D air defence version using the heat seeking PL-9 point defence SAM round was developed but not put into production. 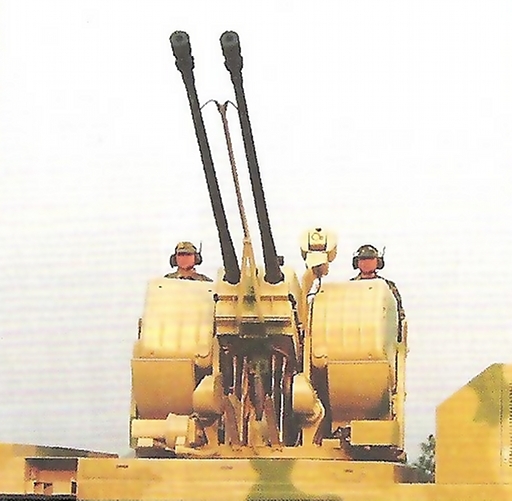 The Type 02 assault gun mounting a 100mm high velocity gun in a turret is in service and the self-propelled gun version mounting the same gun as on the PLZ89 is due into service shortly. The division headquarters comprises an engineer battalion, an electronic warfare battalion, a chemical defence battalion, the division headquarters (company sized), an air defence troop and a guard company for HQ protection. Logistics is provided by corps assets attached to the battle groups as required. Mechanised formations based on this model are well equipped with organic air defence assets, intended to deploy with the units and provide mobile point and limited area defence capabilities against opposing aircraft and helicopters. 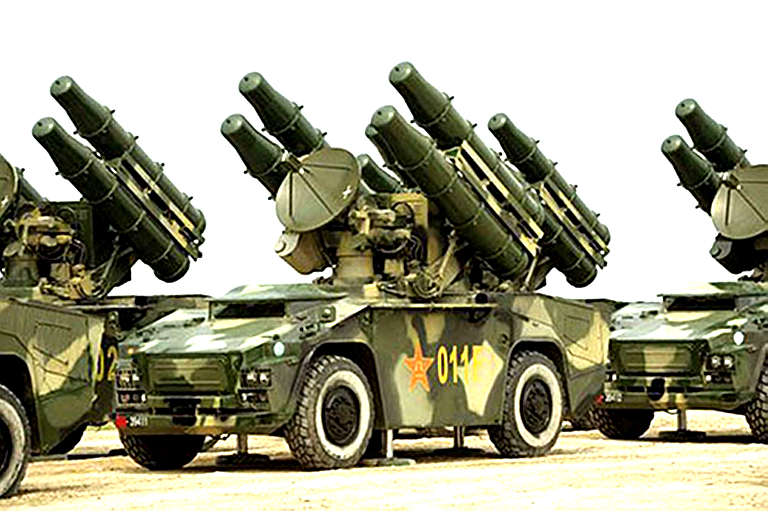 Within each mechanised infantry battalion there is an air defence platoon of three vehicles with four Hongqi6 (HY-6) man portable air defence system (MANPADS) missile launchers per Type 89 APC vehicle, for a total of twelve. 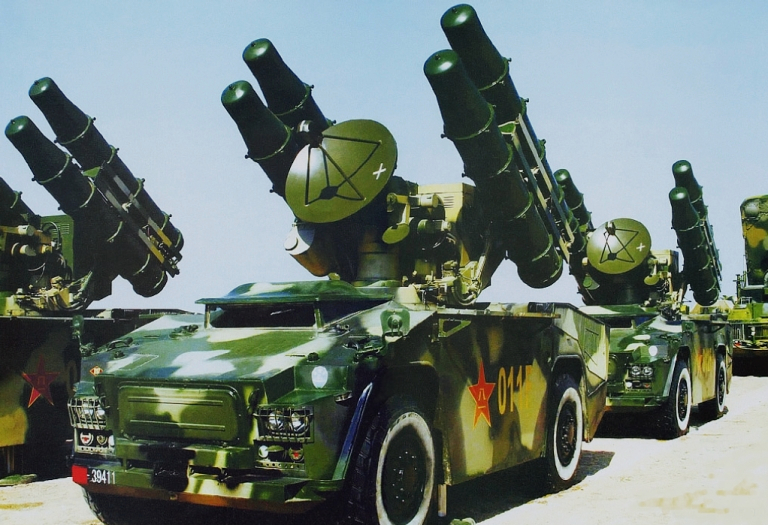 A division has 27 air defence vehicles and has 108 Hongqi6 MANPADS available for air defence at any time. They come under operational control of the air defence brigade commander. 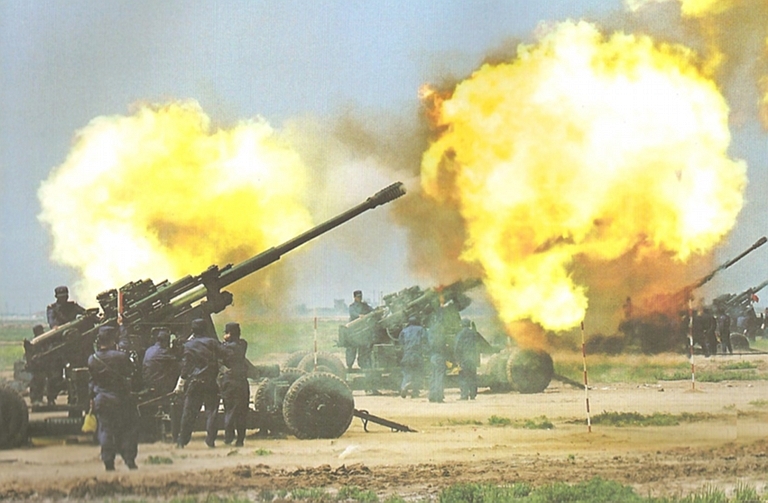 The divisional air defence brigade comprises one battalion of 24 towed 57mm anti-aircraft guns and one battalion of 18 towed twin 37mm anti-aircraft guns. 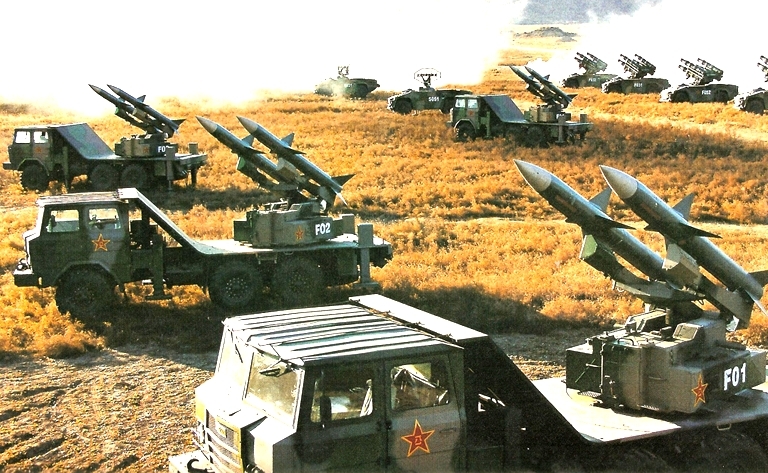 An air defence platoon of six Type 95 self-propelled combination AAA/SAM vehicles and one of light surface-to-air missiles are attached to the artillery brigade. 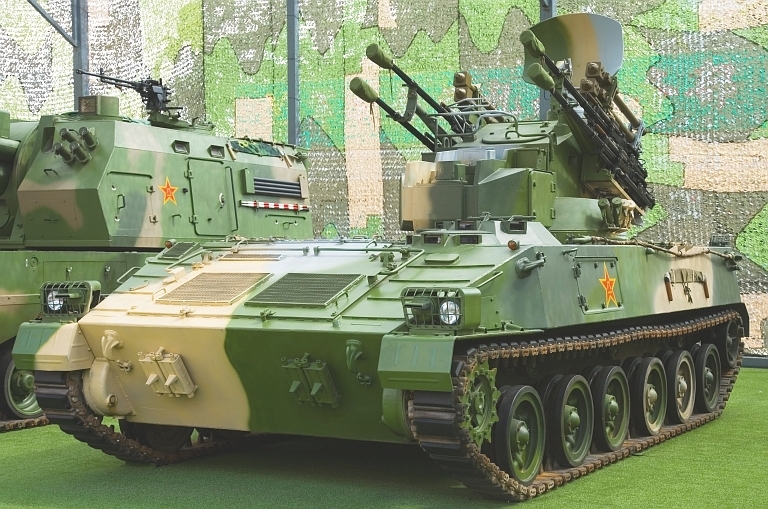 The Type 95 SPAAG/SAM system uses the same hull as the PLZ89 122mm self-propelled gun, with a turret mounting four 25mm automatic cannon and can be fitted with four QW-2 IR-homing, short-range surface-to-air missiles, the Chinese equivalent of the Russian Igla-1 (SA-16 Gimlet). If heavier forces are required to augment the new division, these have been developed as well. These include the Sixth Armoured Division, which has a similar structure to the mechanised infantry division; an independent supporting artillery brigade equipped with 72 152mm Type 83 or the new PLZ45 155mm self-propelled gun, which uses the Chinese built version of the Russian KBP laser guided round; the 16th anti-tank regiment, which is really the size of a small battalion and contains six PTZ89 120mm self-propelled huatang guns and 18 Type 89 Hongjian 8 anti-tank guided missile tank destroyers; and an air defence brigade that contains a battalion of 24 57mm towed anti-aircraft guns and one of six Hongqi 7 SAM systems, the Chinese clone of the French Crotale system. The air defence and anti-tank units are light enough to go with the mechanised division into isolated areas. The PLA still depends on towed AAA despite having vehicles available to replace them. The 37mm and 57mm systems are still capable of causing considerable damage but are showing their age. 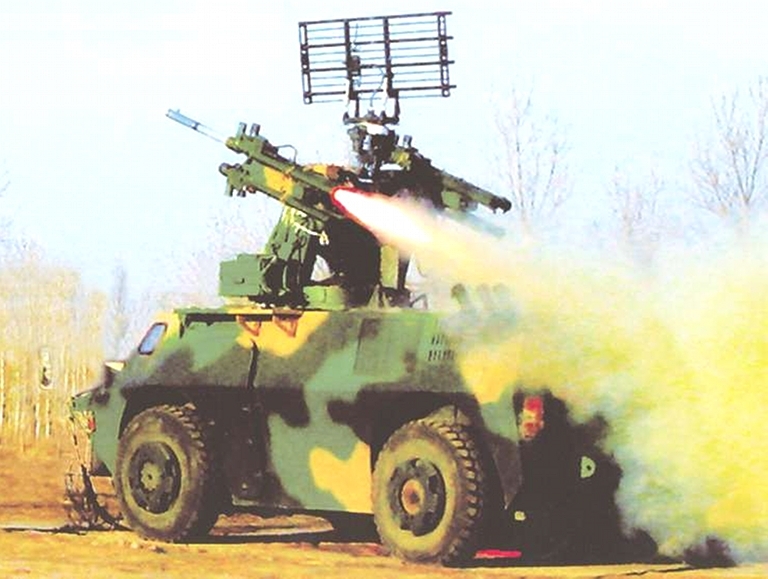 The Type 95 SPAAG is a PLA attempt to produce a capability equivalent to the ZSU-23-4M4, providing a mix of gun and heatseeking missile armament. The system is equipped with a CLC-1 search radar, claimed to operate in the S-band. Target tracking is provided a thermal imaging and TV system with a laser rangefinder. 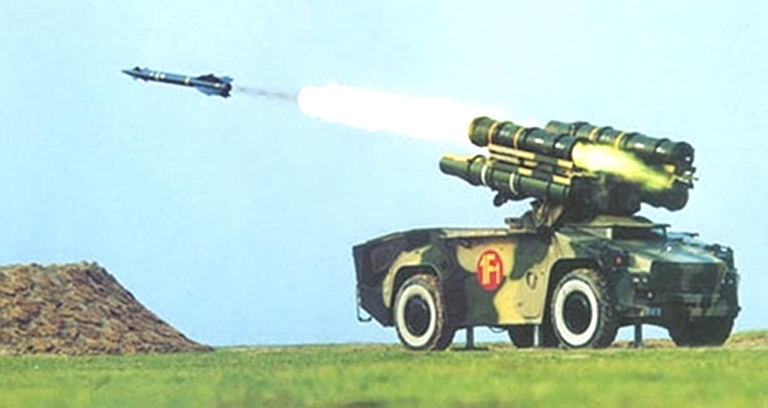 The Type 95 is armed with four gas operated 25 mm guns, providing an aggregate rate of fire up to 1600 rounds/min, and up to four QW-2 heatseeking missiles, based on the PLA MANPADS, can be carried. Accompanied by a battery acquisition and command vehicle equipped with a CLC-2 search and acquisition radar with its large antenna, an air defence battery of six Type 95 SPAAGs is used to protect divisional artillery assets. 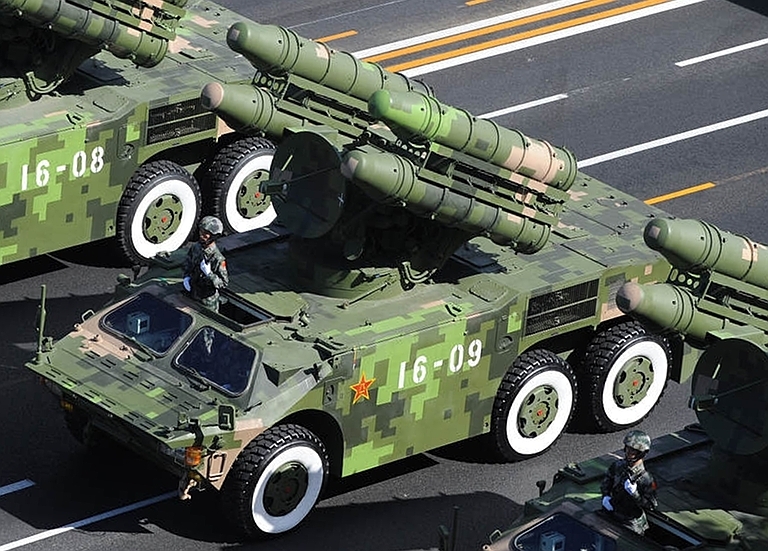 To simplify maintenance the Type 95 uses the same standard hull as PLA artillery vehicles including the Type 83 152mm and PLZ-89 122mm self-propelled guns, the PLZ89 122m self-propelled anti-tank gun and the PHZ89 122mm self-propelled multiple rocket launcher. Type 95 SPAAG firing with guns elevated and CLC-1 radar stowed. 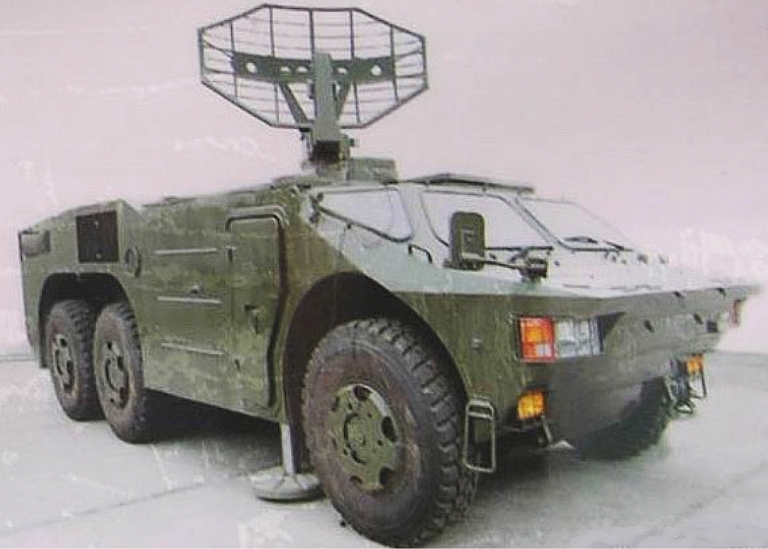 Type 95 battery command vehicle with CLC-2 search radar deployed (above) and stowed (below). 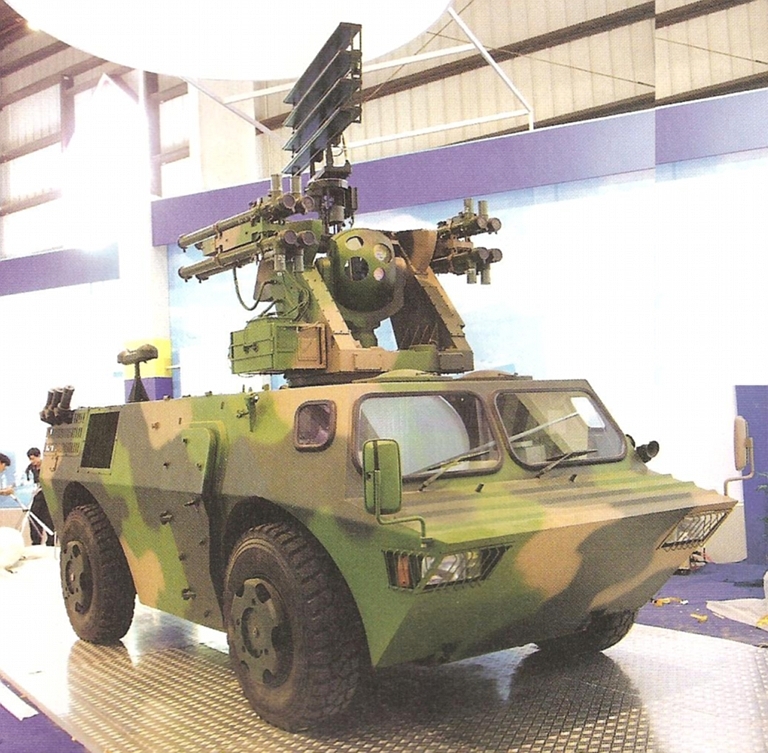 The Ludun-2000 is a Chinese copy of the Thales Nederland Goalkeeper 30 mm close-in weapons system (CIWS) mounted on the rear a 8 x 8 single cab flat bed truck and generator and system container behind the cabin. The Type 730B gun is a copy of the General Electric GAU-8 30 mm x 173 mm seven-barrel Avenger gun used on the A-10. It fires at 4,200 rounds-per-minute with the APDS round having a muzzle velocity of 1,150m/sec and the HE cartridge of 920m/sec. There are two 500 round cylindrical magazines either side of the gun. The system can intercept targets flying at a velocity of Mach 2 or below. Although a target can be optically tracked up to 18 km, a cruise missile with a radar cross section of approximately 0.1 m2 can be detected at 12 km, optically tracked using a charge coupled device at five km. The gun has a maximum effective range of 2.5 km, its intercept engagement range between 1000 to 1,500 m and a maximum ground range of 3,000 m. The response time of 9.8 sec is given the system is able to simultaneously track and prioritise 48 targets. In the anti-aircraft role, the Ludun-2000 system is claimed to be as effective as a battalion of 18 Type 65 twin 37mm anti-aircraft guns. In the counter rocket and mortar (C-RAM) role, it is claimed that when cued by an AN/TPQ-37 Block 1B Firefinder artillery locating radar of between 60 to 70 percent of 60 mm and 81 mm mortar rounds, and there is enough ammunition for 50 engagements against mortars and rockets. 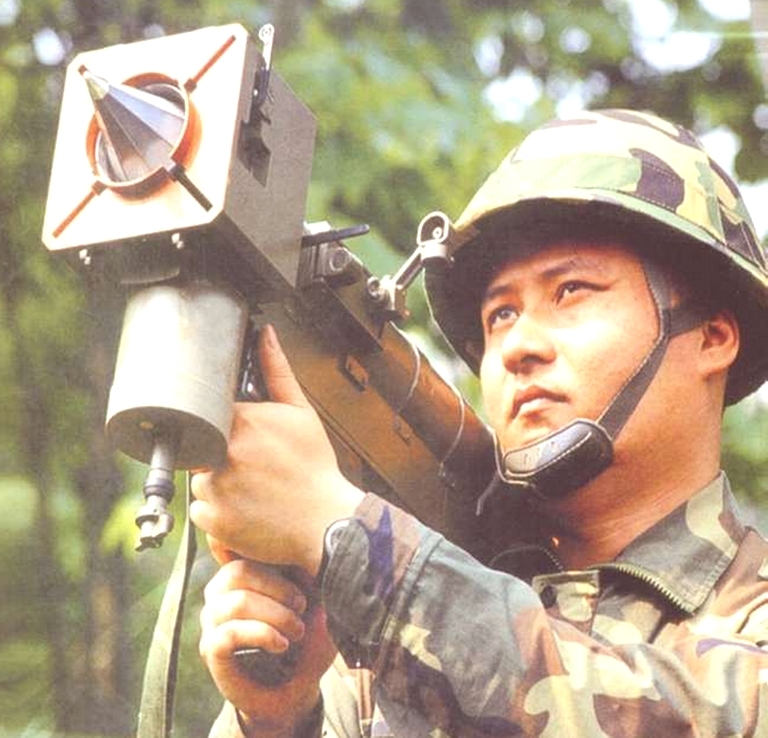 The PLA employs the SLC-2 which is an improved clone of the TPQ-37 series. By design, the LD-2000 is essentially a land based derivative of the existing PLAN Type 730 CIWS, itself modelled on the closed loop tracking US Phalanx CIWS and EU Goalkeeper CIWS. 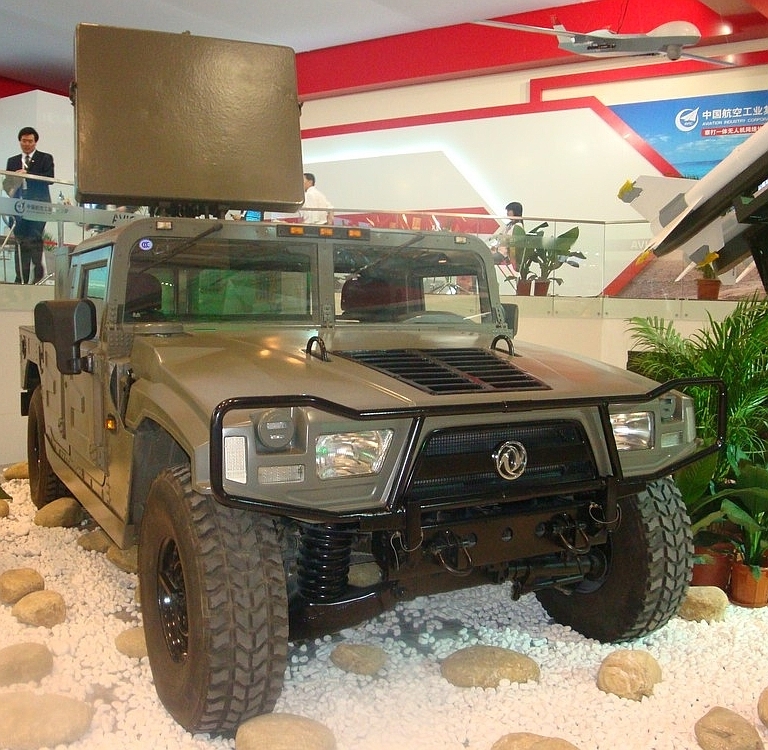 Production vehicles are intended to be based on the Wanshan WS-2400 chassis, common to the HQ-9 SAM system. The engagement and tracking radar as yet undesignated, operates in the Ku-Band. 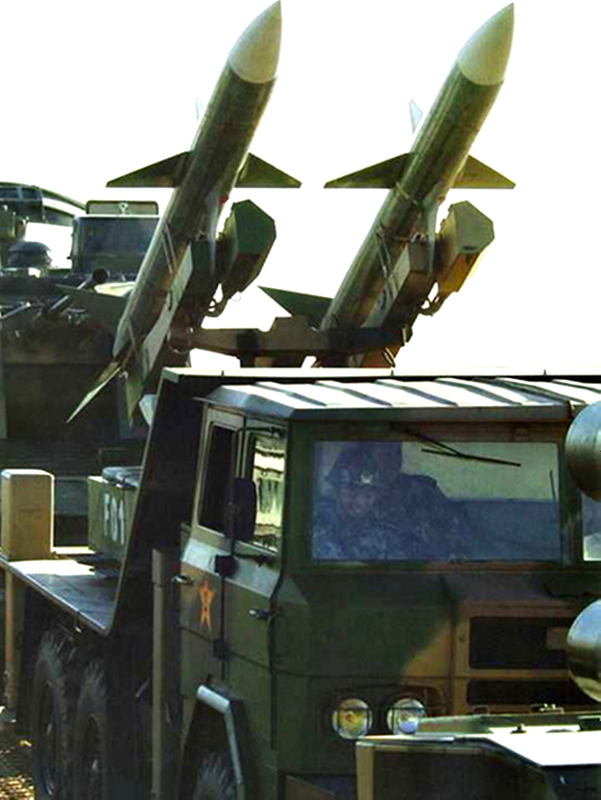 More recent imagery depicts the addition of a mast mounted search radar and six launch tubes for the TY-90 Surface-to-Air-Missile. While intended to fulfill much the same role as the Russian Pantsyr S1 / SA-22 system, the LD-2000 is hampered by older technology acquisition and engagement radar technology in comparison with its Russian competitor. 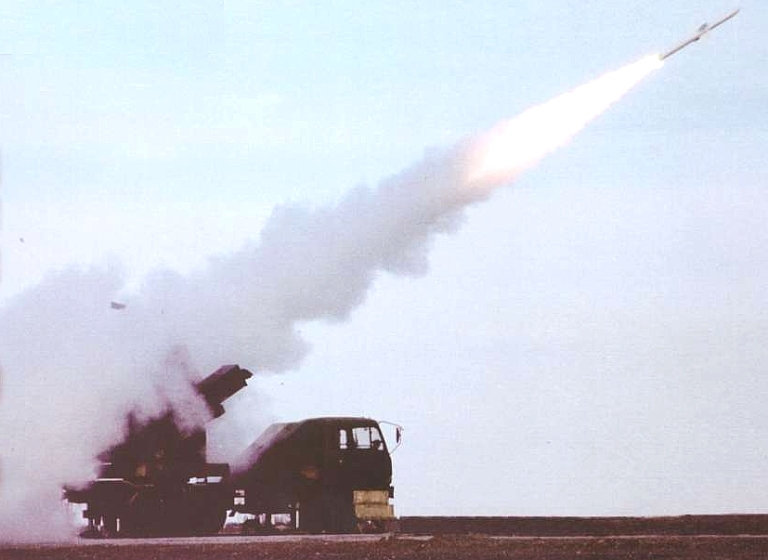 The cited use of SLC-2 / AN/TPQ-37 Block 1B Firefinder artillery locating radar indicates an intent to address this capability limitation. This radar is however optimised for the CBR role, which differs in geometry from the Counter-PGM roles. This will limit the system's ability to acquire and track low signature targets, especially guided weapons. 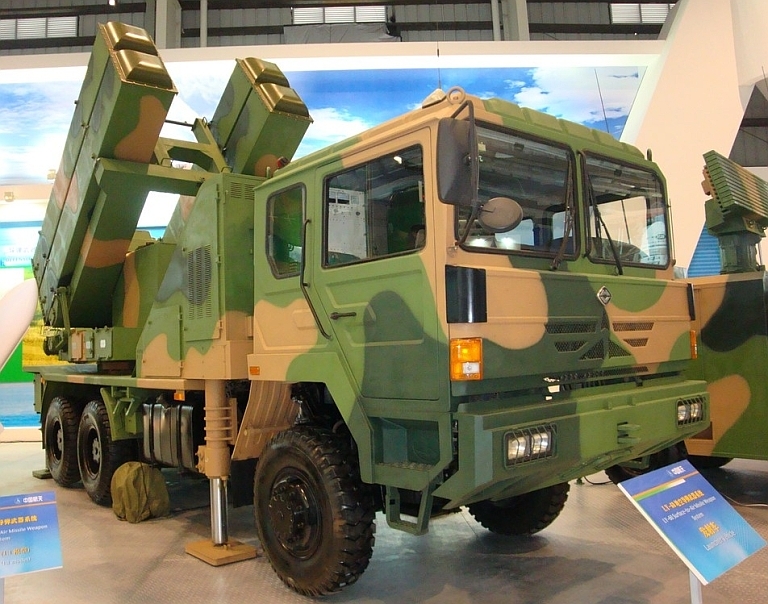 To date no evidence has emerged showing the integration of extant PESA air defence engagement radars such as the H-200 or SJ-231 with the LD-2000 system, both of these radars providing the power-aperture performance and beam-steering agility required to make the LD-2000 genuinely effective in killing salvoes of high angle low signature smart munitions. A single H-200 or SJ-231 supporting three, four or six LD-2000 fire units makes for a formidable point defence capability. Current acquisition radar technology does not preclude further development of this system as China's industry eventually masters PESA and AESA antenna technology. A mature LD-2000 variant has the potential to be a very effective terminal defence weapon against supersonic and subsonic guided weapons. LD-2000 demonstrator image from Norinco brochure. 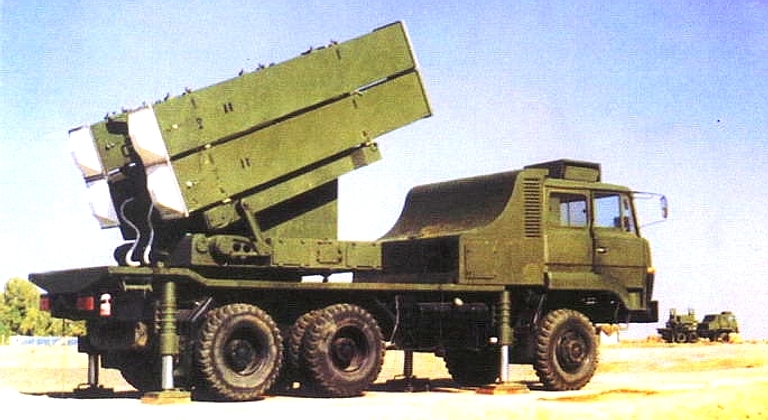 LD-2000 SPAAGM variant with six TY-90 launch tubes, on WS-2400 chassis. Elevating acquisition radar appears to be a variant of the YJ-17 series. Recently unveiled, the CSSA-1 is a self-propelled variant of the Type 90 35 mm AAA system, previously only available as a towed AAA piece. The system is based on a licensed Oerlikon GDF-002, and is credited with a 1175 m/s muzzle velocity, 3200 metre effective range, and 2 x 500 rounds/min rate of fire, with 360° traverse and +92° to -5° elevation. A Type 902 engagement radar is usually associated with the Type 90 AAA system, based on the Oerlikon Skyguard I/II system. 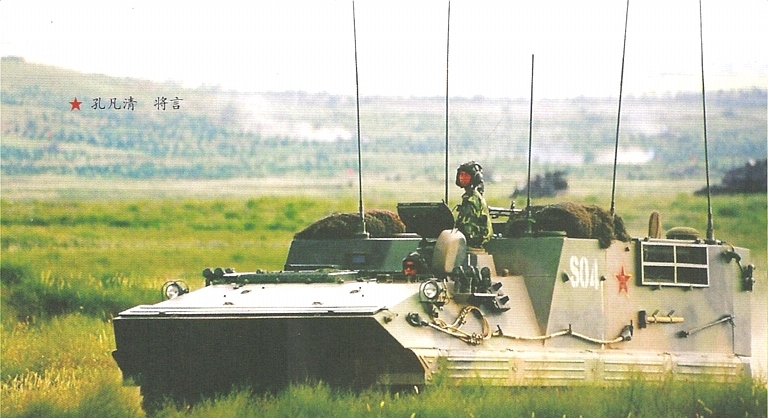 The Super Fledermaus / Skyguard radar and GDF guns were used in the German Gepard SPAAG. 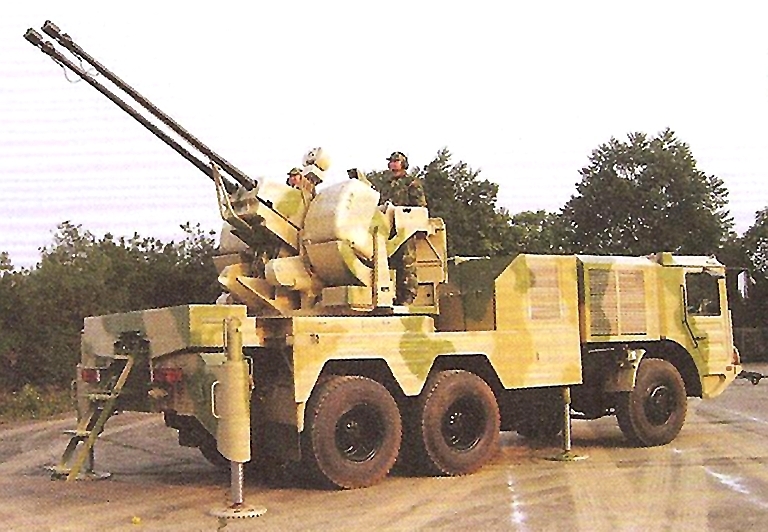 Type 90 35 mm towed AAA gun, deployed and stowed. 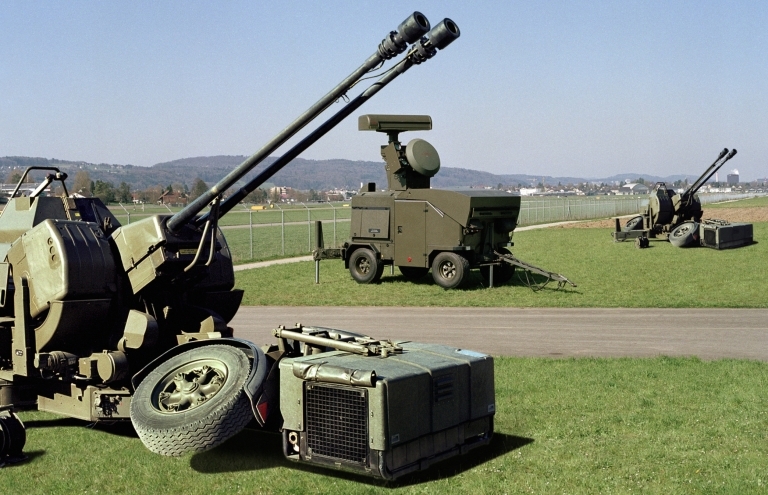 Oerlikon-Contraves GDF/Skyguard III 35 mm gun and engagement sensor, comprising acquisition and engagement radars and electro-optical tracker (Rheinmetall/Oerlikon). 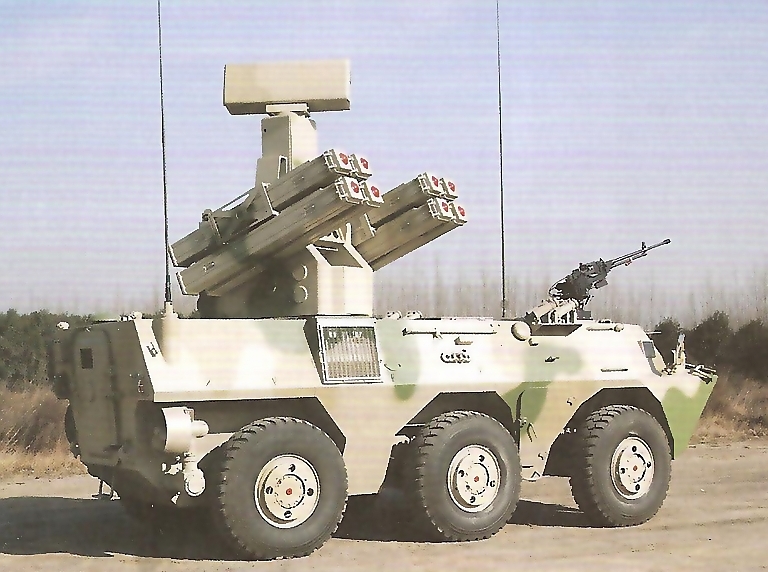 The CPMIEC TD-2000B system is an integrated package combining QW-1 or QW-2 MANPADS launchers on a vehicular chassis, towed 57 mm guns, and an acquisition/engagement radar and fire control processing package. A typical battery combines six 57 mm guns, one eight round launcher, and a single radar vehicle, equipped with what appears to be a JY-17 variant. The HQ-7 is a Chinese clone of the French Thales/Thomson CSF Crotale SAM. During the 1970s the French supplied samples of the Crotale which was promptly reverse engineered. The cloned Crotale has been built in two configurations, a high mobility variant for PLA Army units on a 4 x 4 cloned French Thomson-Hotchkiss P4R armoured vehicle, and a less mobile PLA-AF air field defence system, using either a trailer or a truck platform. The Thomson-Hotchkiss P4R vehicle uses either a diesel or gasoline engine driving an alternator which powers electrical motors driving the wheels. Chinese sources sometimes label the P4R as a B-20. A naval variant of the Crotale as also been developed. The HQ-7 Crotale round on display. 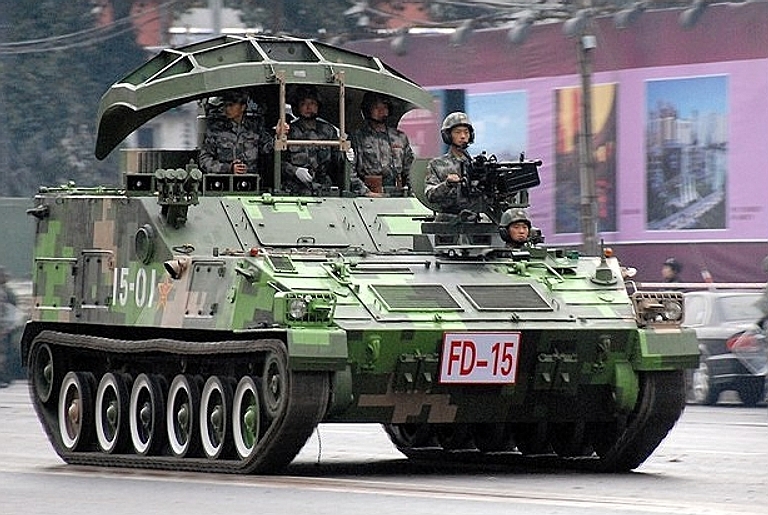 FM-90 TELAR on parade in 2009 (via Chinese Internet). FM-90 Crotale display model at Zhuhai, 2008. The acquisition radar uses a planar array with a boresighted IFF array. 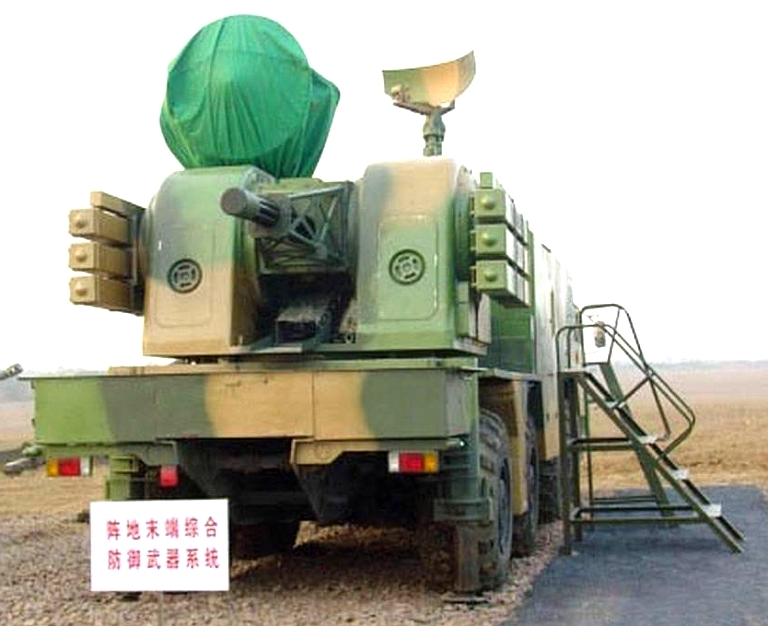 The engagement radar appears to be identical to the earlier FM-80 configuration (image © 2009, Zhenguan Studio). Acquisition radar vehicles for a HQ-7/FM-80 battery. The design concept follows the Soviet Dog Ear model used with the 9K35 / SA-13 Gopher. Two radar types have been disclosed, a concave reflector design and a newer planar array design. 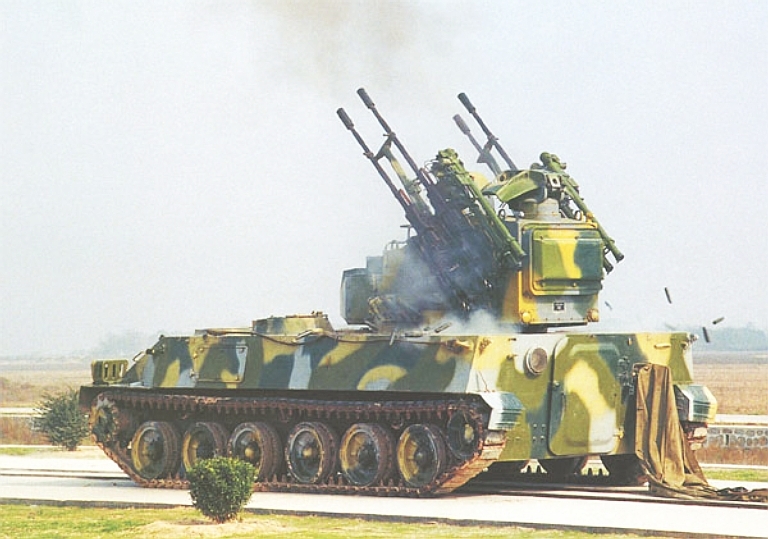 The earlier self propelled HQ-7/FM-80 variants employ a reverse engineered variant of the original Thomson-Hotchkiss P4R electrically driven armoured chassis which weighs in at 32,965 lb / 14,950 kg (all images Chinese internet). Late model FM-80 Crotale launch from cloned Thomson-Hotchkiss P4R chassis. Note the PLA-AF towed HQ-7 variant in the background, below the foreground. 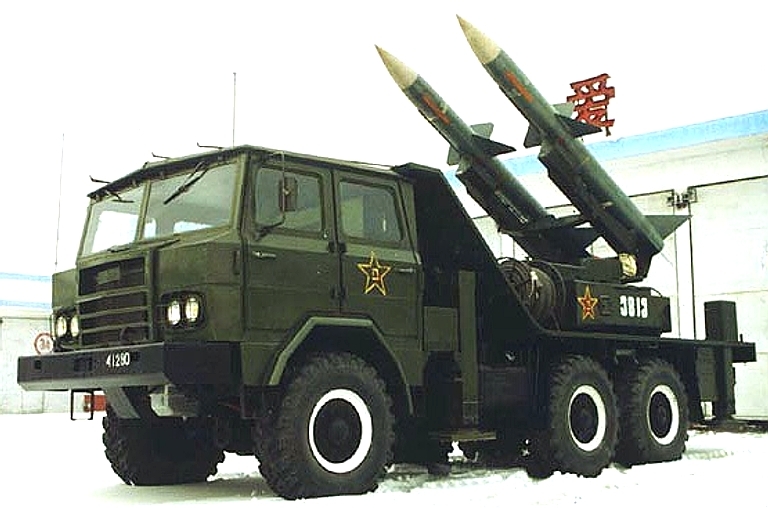 The US DoD credits the PLA with 30 “HQ-6” launchers, most likely referring to the HQ-61 series point defence SAMs deployed during the 1980s. Based conceptually on the cloned Alenia Aspide missile, itself which is based on the US RIM-7E/F Sparrow, the HQ-61 is much larger and heavier and equipped with a semi-active radar homing seeker and midcourse command link guidance. 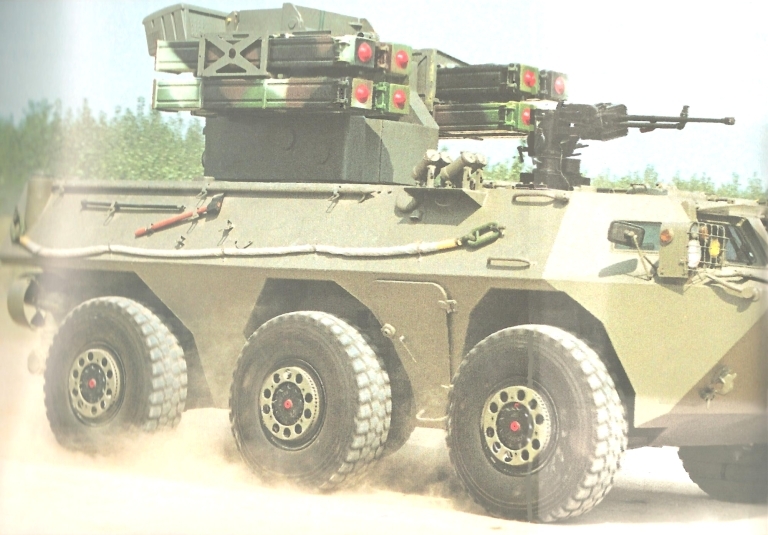 A 6x6 YanAn SX2150 truck carries two rounds on a slewable elevating launcher. Guidance is provided by the Type 571 radar system. The cumbersome HQ-61 series has been largely superceded by the HQ-7 and HQ-64 point defence SAMs. A mixed deployment of the HQ-61 and HQ-7 Crotale. HQ-61 6 x 6 TEL vehicle. 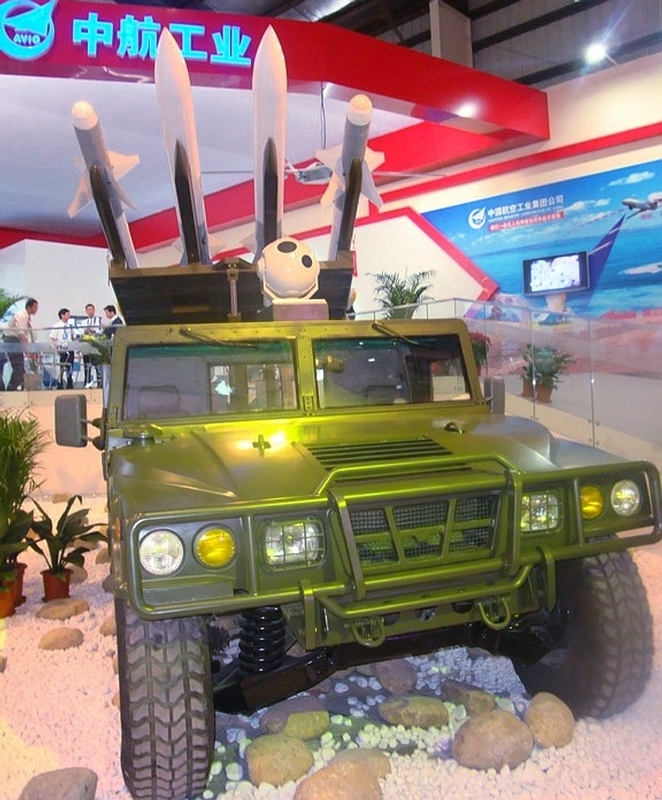 The LY-60 four round TEL (image © 2009, Zhenguan Studio). The CPMIEC LY-60 is a direct clone of the Italian Selenia (Alenia) Aspide Mk.1, itself derived from the RIM-7E Sea Sparrow. 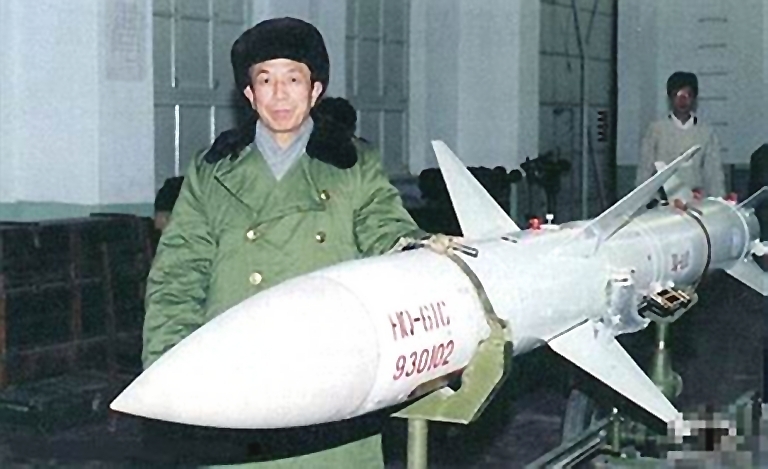 This missile is frequently cited as the direct replacement for the conceptually similar but much bulkier HQ-61. 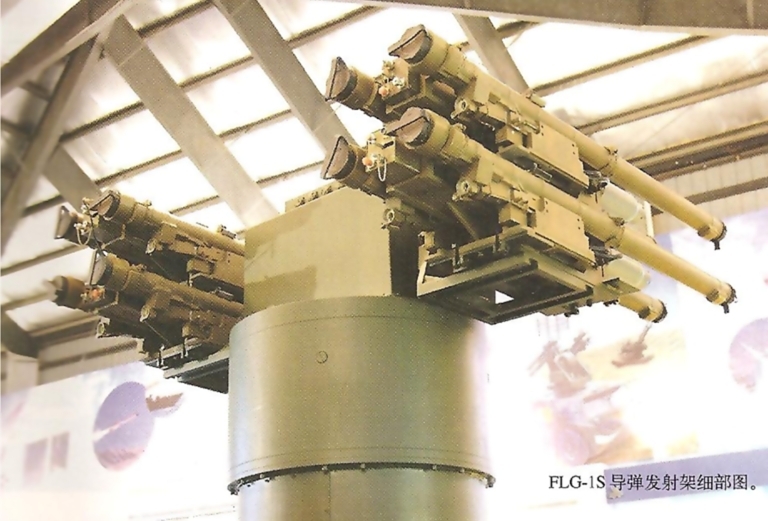 Recent literature shows a four round LY-60 TEL which is based on the naval box launcher mount, similar to the US Sea Sparrow and original Aspide designs. Like the Aspide / Sparrow, the LY-60 appears in naval and mobile point defence SAM configurations, and as an AAM for fighter aircraft, designated as the FD-60 or PL-10. The missile is a semi-active homing design, reliant on a CW illuminator which is cued by an acquisition and tracking radar. 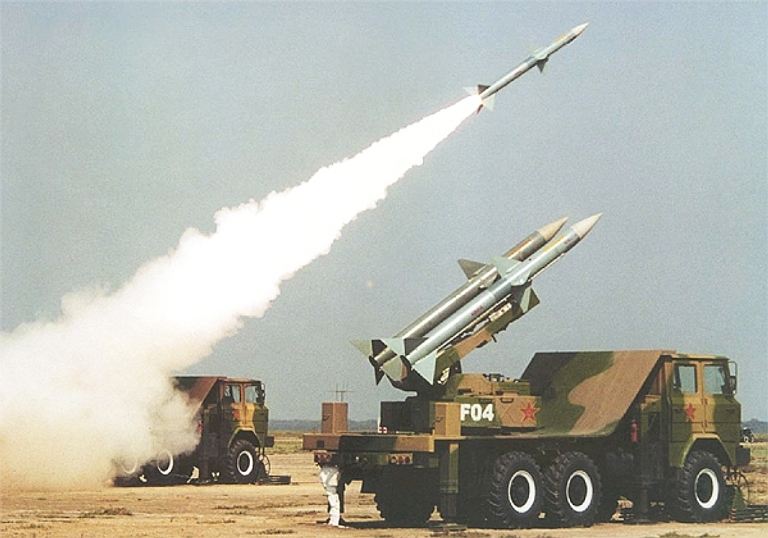 Cited battery composition is one acquisition radar, three engagement radars and six TELs, with eight support vehicles providing missile transport, backup and primary power supply, missile test, electronics maintenance, mechanical maintenance, tools and spares. 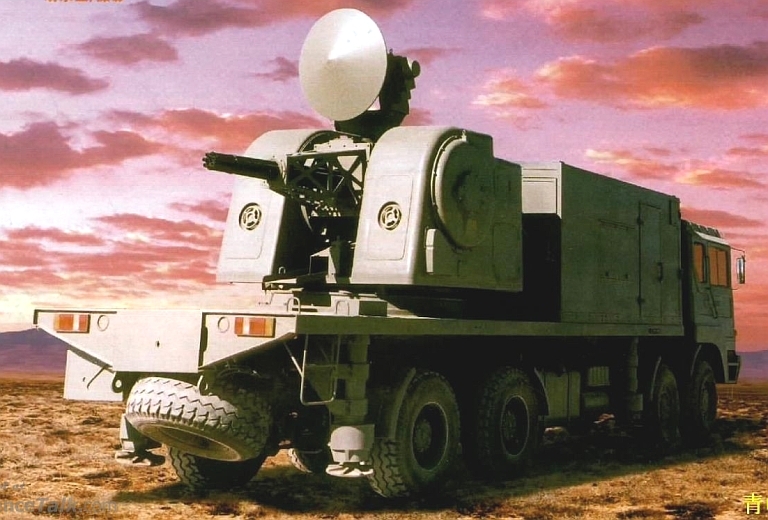 The acquisition radar is likely to be a derivative of the CLC-2 series operating at 2.9 ~ 3.4 GHz, or the YLC-6M. 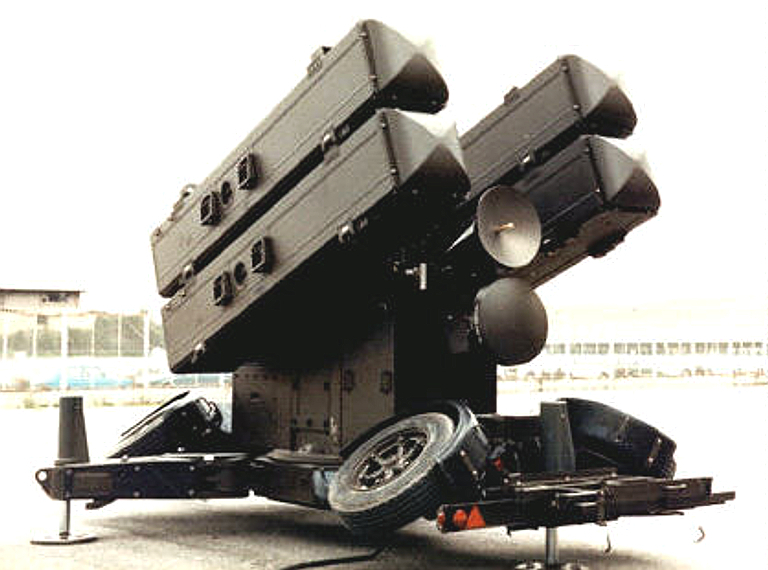 The engagement radar is a truck mounted variant of the naval LY-60 engagement radar, which is a single channel X-band design with providing CW illumination of the target. Until recently, no good imagery was available for the radar package, specifications remain unstated. CPMIEC brochures claim the capability to engage low flying aircraft and cruise missiles. Other sources claim the capability to detect 40 targets, track 12, and engage three. The LY-60 displays the same clipped wings as the box launch late model Aspide. 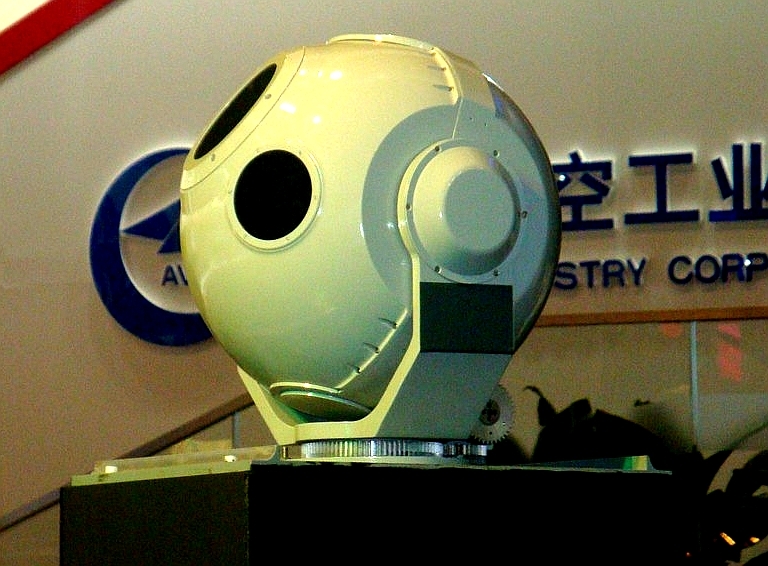 In the background, the engagement radar with a CW illuminator (image © 2009, Zhenguan Studio). 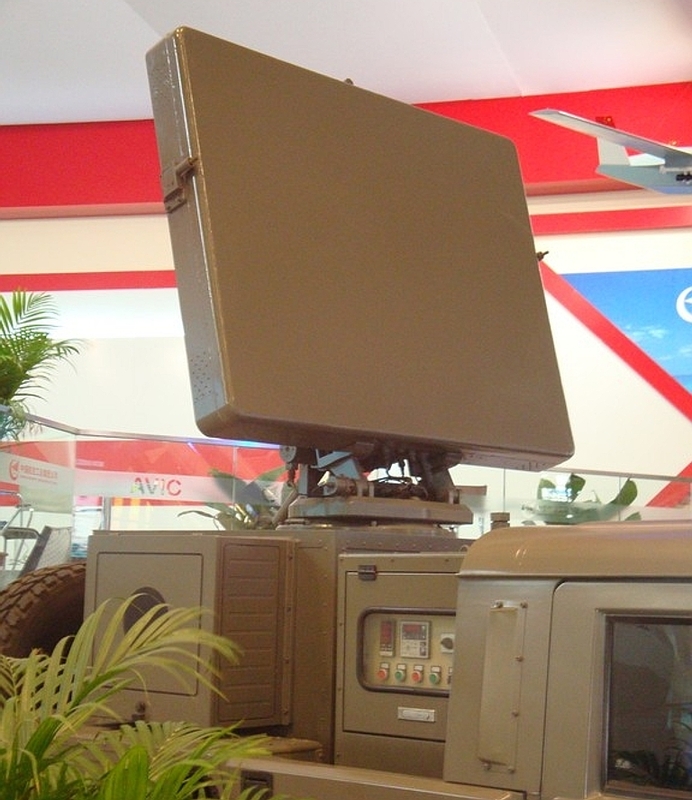 The LY-60 engagement radar with a CW illuminator/tracker (image © 2009, Zhenguan Studio). The LY-60 acquisition radar. This design is nearest in configuration to the YLC-6M series, and is likely a direct derivative (image © 2009, Zhenguan Studio). 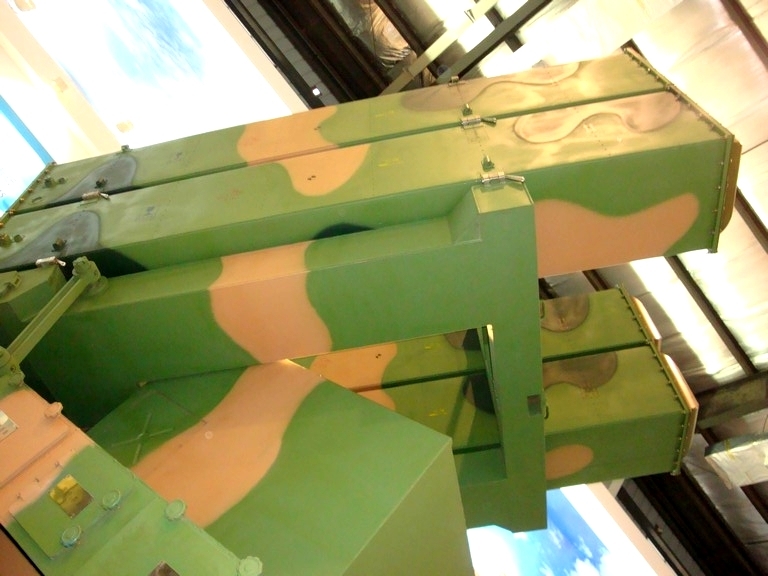 The LY-60 four round TEL, below detail of box launchers (images © 2009, Zhenguan Studio). Above/below Alenia SPADA/Aspide towed launcher. The tracker and CW illuminators are colocated on the mount, no such antennas being visible on the LY-60 TEL. 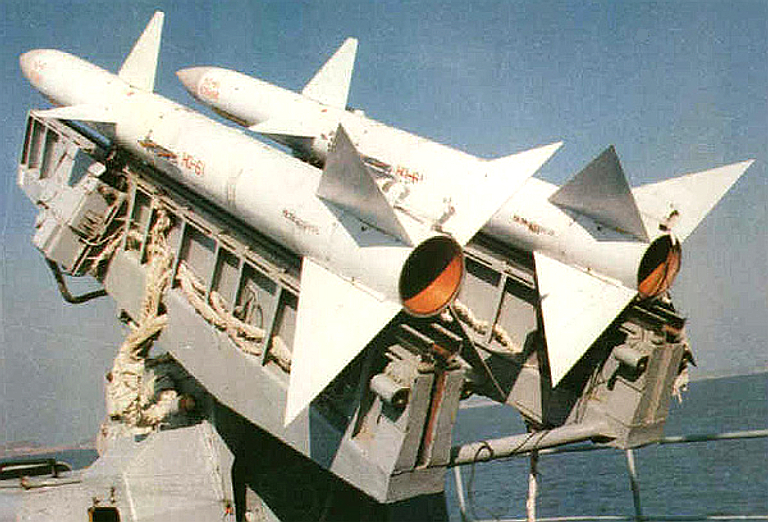 PL-10/FD-60 air launched variant of the cloned Aspide. The Type 89/ZSD89, also known as the WZ534, is 6634mm long, 3148mm wide, 1890mm high at the top of the hull and 2556mm high including the 12.7mm semi-enclosed turret, which is a copy of the turret used on the M113 ACAV during the Vietnam War. The supercharged diesel engine is rated at 319 horsepower and gives the vehicle a top road speed of 65km/hr and 6.5km/hr in the water. The vehicle has a maximum road range of 500km and 61km in the water. With a combat weight of 14.5 tons, the power to weight ratio of 22hp/ton enables the ZSD89 to climb a 32 degree slope. There are four twin 76mm grenade launchers, two sets on both sides just behind the glacis plate. There are four vision blocks and rudimentary firing ports on the right side, one of each in the smallish rear door which swings outwards, and three of each on the left hand side of the vehicle. The lack of a rear folding ramp like on the M113 is a severe drawback. The 12.7mm heavy machine gun has 1050 rounds stored in the vehicle and provides close in air and ground defence. 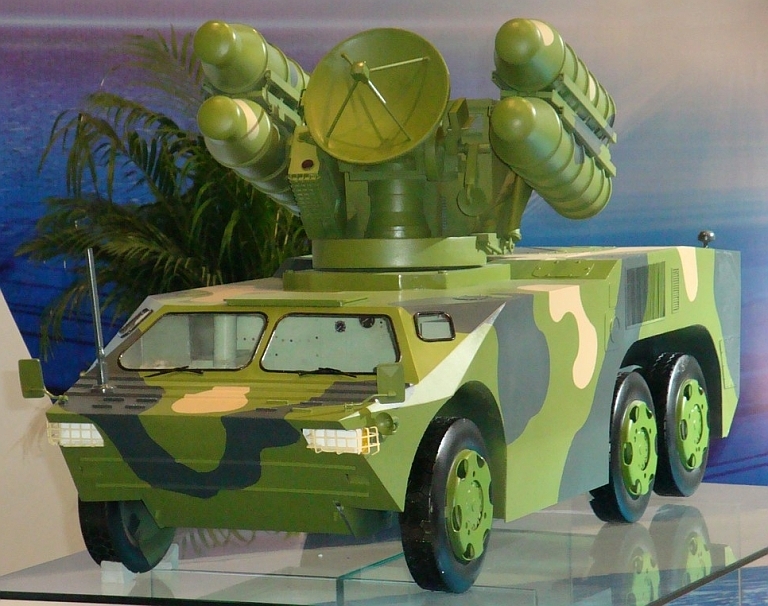 Four Hongqi 6 MANPADS are carried along with spare missiles. There would be around nine air defence gunners who would operate the missiles, man the 12.7mm machine gun and listen to the air defence net for targets. The vehicle itself has a two man crew, comprising a driver and vehicle commander. The FB-6A is a copy of the United States Army’s AN/TWQ-1 Avenger system which mounts the Stinger short-range surface-to-air missile on an octuple launcher on a HMMWV chassis. The HMMWV variant employed is the aluminium body Shenyang SFQ2040. 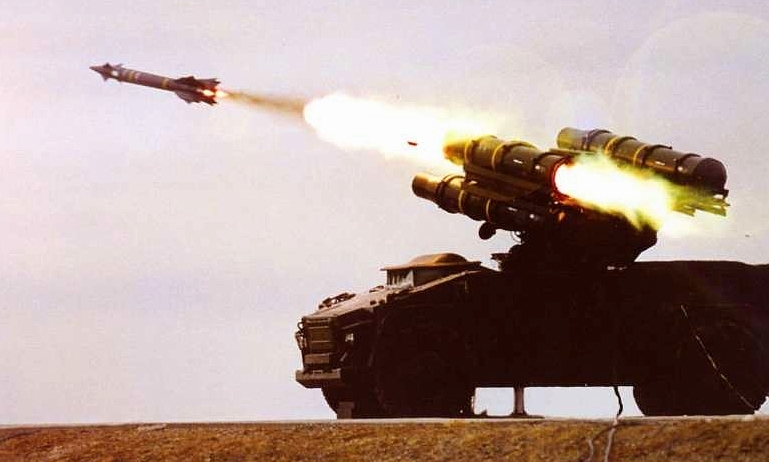 Designated the FB-6A it uses the TY90 surface–to-air missile that is 1,862 mm long, 90 mm in diameter and weighs 20 kg. The missile is quoted as having an effective range of between 500 to 6,000m; can engage targets flying at altitudes from 15 to 4500 m; and can reach Mach 2.2. The launcher is quoted, as being able to acquire a target a 12 km, a reaction time of 2 to 3 seconds and the vehicle and launcher are a direct copy of the HMMWV. 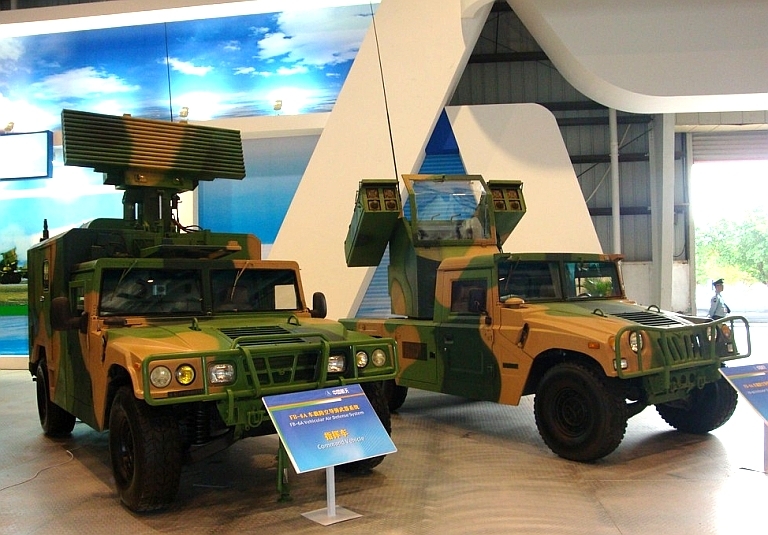 Above, FB-6A engagement radar and TEL, below FB-6A engagement radar, both carried on the Shenyang SFQ2040 HMMWV (image © 2009, Zhenguan Studio). 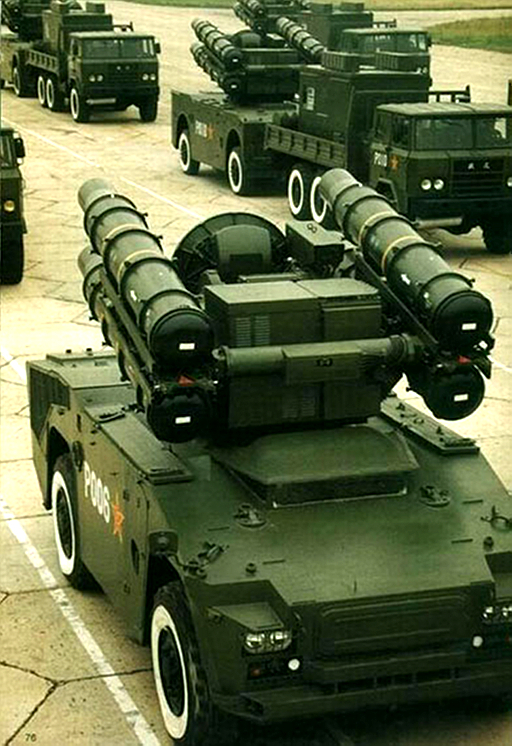 LS-II ADS TEL with a pair of SD-10/PL-12 active radar guided missiles and a pair of PL-9C heatseeking missiles (image © 2009, Zhenguan Studio). 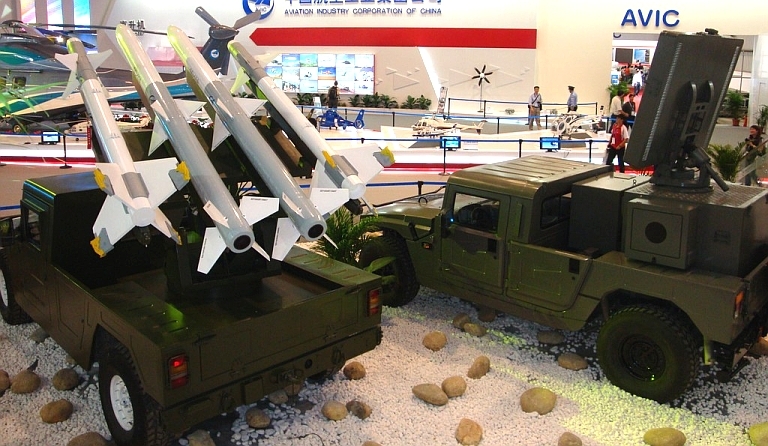 The Lie Shou “Hunter” II Air Defense System or “LS-II ADS” was displayed publicly at the Zhuhai 2008 exhibition. 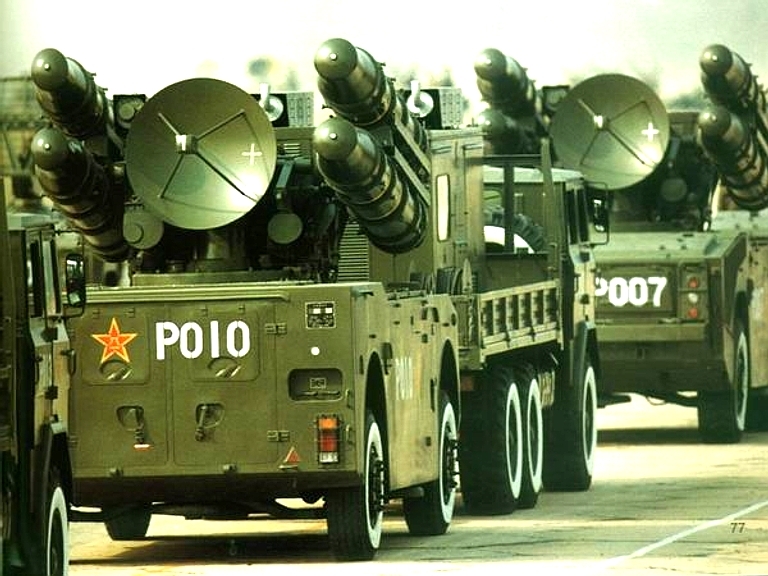 It is a Chinese analogue to the US MIM-120/MPQ-64 Sentinel “SLAMRAAM” point defence system, but with the important distinction in a mixed missile armament, comprising two SD-10/PL-12 and two PL-9C. 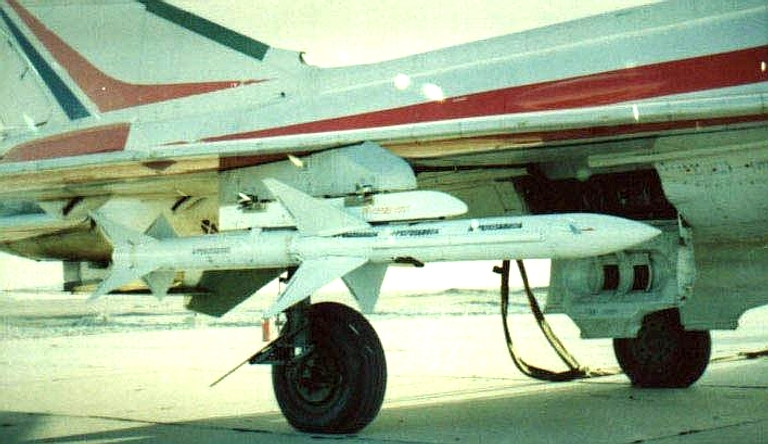 The SD-10/PL-12 is an analogue of the AIM-120 AMRAAM, but with better range performance, and equipped with the Russian designed Agat 9B-1103M active radar seeker. The PL-9C is an analogue of the AIM-9H/L Sidewinder. The LS II is therefore a defacto hybrid of the Chapparel and SLAMRAAM concepts, but with a self propelled engagement/acquisition radar rather than the towed MPQ-64 radar used with the SLAMRAAM. 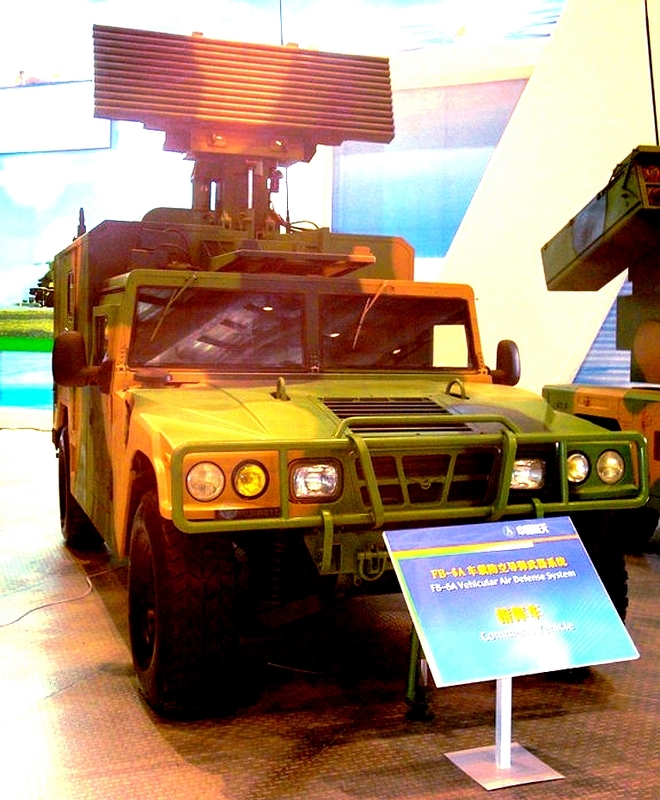 Both the TEL and the engagement/acquisition radars are carried on the Dong Feng EQ-2050 HMMWV. The TEL is equipped with an electro-optical acquisition and tracking sensor mounted on the cabin roof. The radar is a planar array design, likely operating in the X-band. 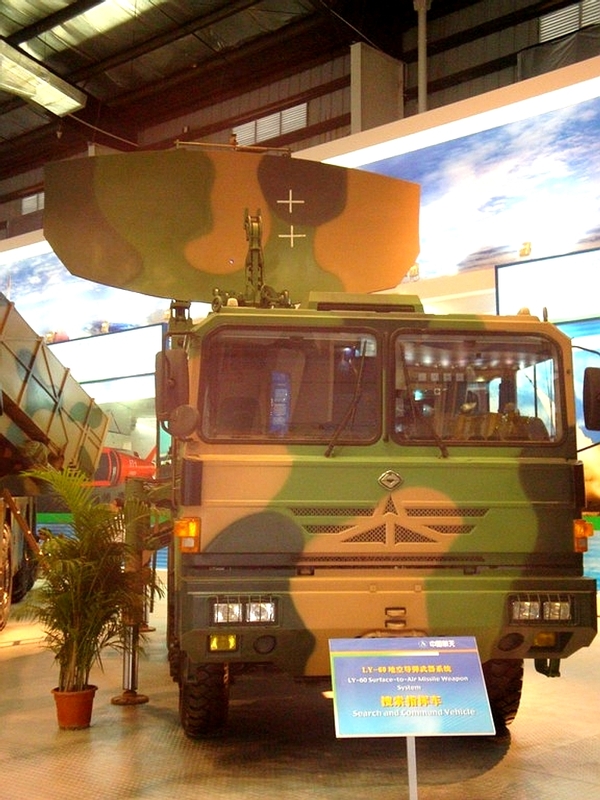 LS-II ADS TEL and engagement/acquisition radar (image © 2009, Zhenguan Studio). LS-II ADS TEL (image © 2009, Zhenguan Studio). LS-II ADS TEL EO system (image © 2009, Zhenguan Studio). 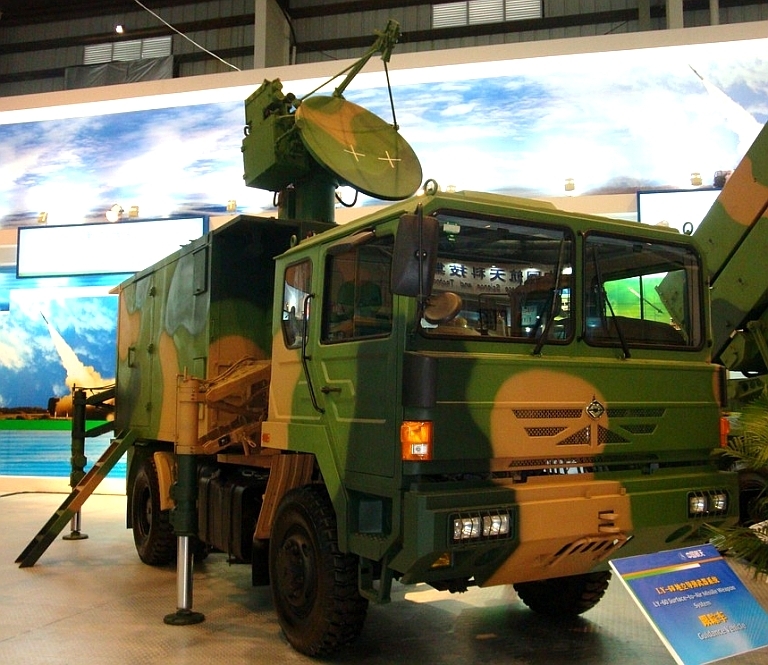 LS-II ADS engagement/acquisition radar and antenna (image © 2009, Zhenguan Studio). 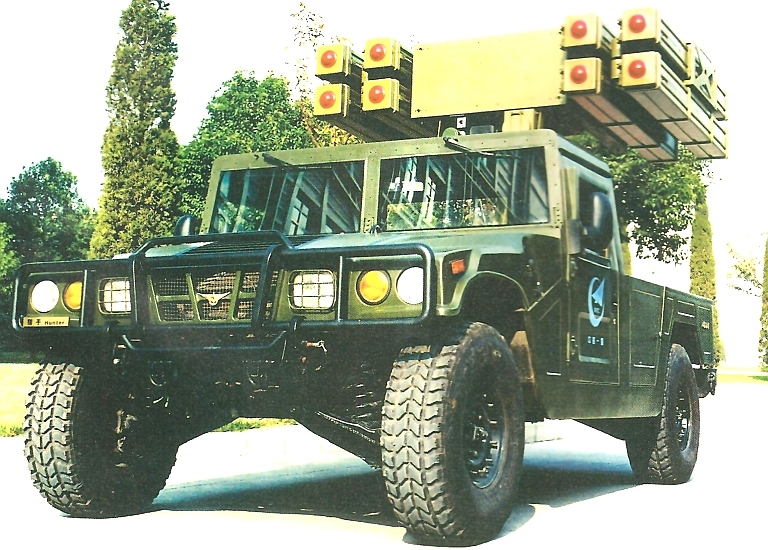 SLAMRAAM battery with two TELs, MPQ-64 radar and C3 vehicle (US Army). 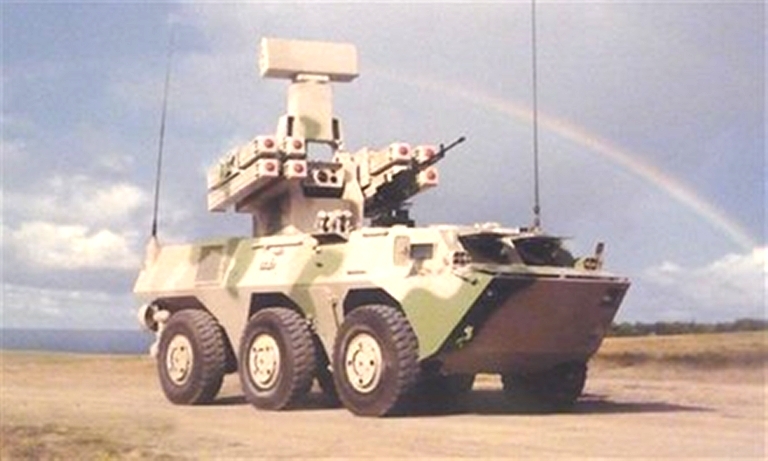 The FLV-1 close in lightweight air-defence weapon system is based on the WZ 551 four wheeled armoured vehicle. 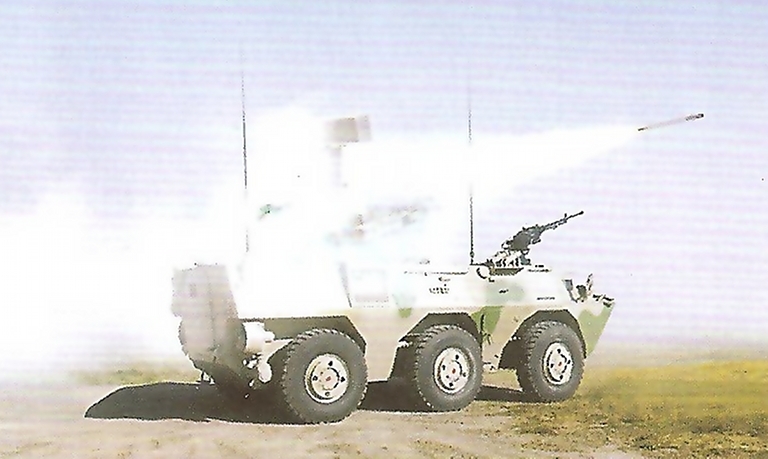 This vehicle appears to be half way between the United States Army’s AN/TWQ-1 Avenger system which uses the Stinger short range surface-to-air missile on an octuple launcher on a HMMWV chassis, and the Russian 9K31 Strela-1 system (SA-9 ‘Gaskin’) based on the BRDM 4 x 4 chassis. The FLV-1 uses the rear engine version of the WZ 550 4 x 4 chassis but has only two-wheeled drive. The FLV-1 weighs 8.5 tonnes, is 5.5 metres long and the rest of the chassis is the same as the WZ 550. The engine produces 132kw of power with a maximum road speed of 90 km/hr. There are six smoke dischargers in two rows of three at the rear of the vehicle. The FLV-1 carries a pintle mounted 7.62 mm machine gun at the front of the vehicle for local defence. 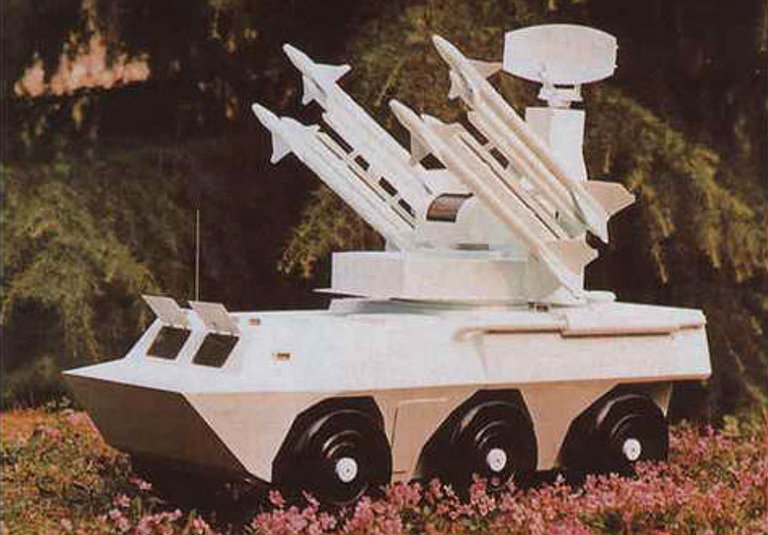 The octuple launcher turret houses two quad launchers for the QW-1A lightweight surface-to-air missiles. There is a FLIR, laser rangefinder, and most probably a laser designator, contained in a ball mount between the missiles with a search radar mounted on the top of the system. The search radar appears to be a variant of the NRIET AS-901 series, an L-band MTI with ~20 km range. The FLV-1 can be used for used for independent close in protection of high value assets. The FL-2000 is a derivative of the FLV/FLG-1 series. The FLG-1 is a derivative of the FLV-1 series. 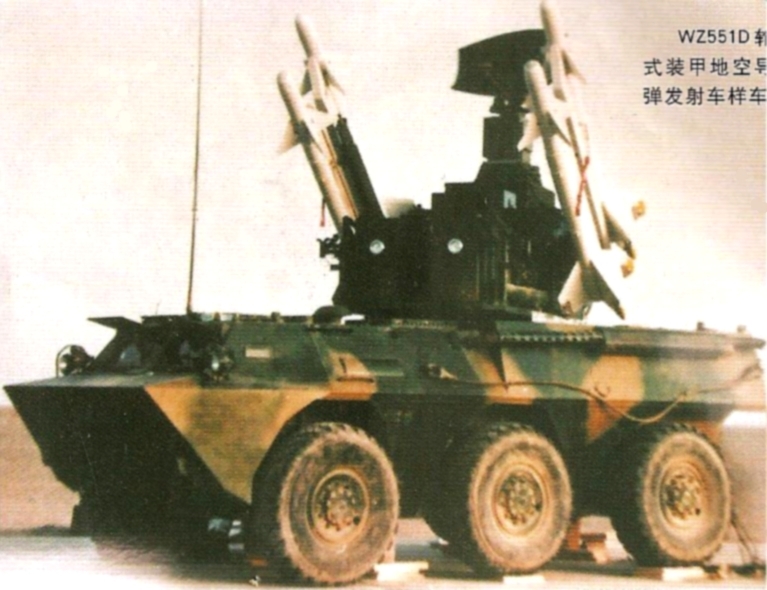 The WZ551D wheeled air defence vehicle was ordered in 1987 as an air defence variant of the WZ551 family, using the PL-9 surface-to-air missile system. 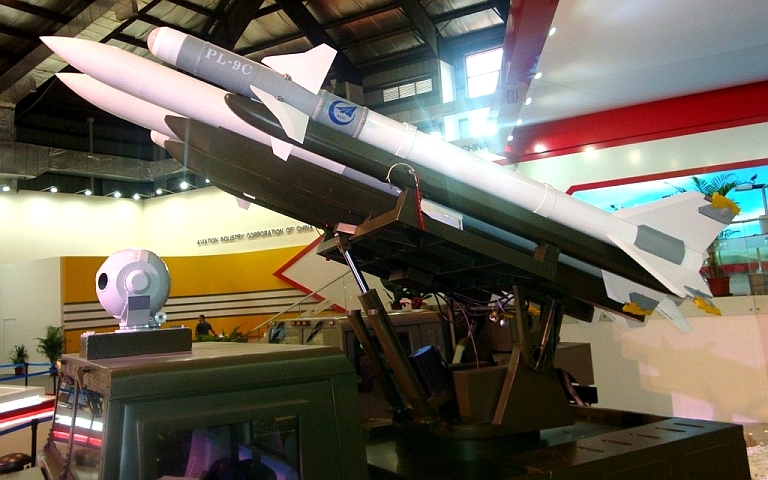 The PL-9 is conceptually closest to the AIM-9P and appears to be an evolution of the PL-5 series missile, although Chinese sources claim the missile outperforms the AIM-9L/M. It was not a success as only one prototype was built and tested. 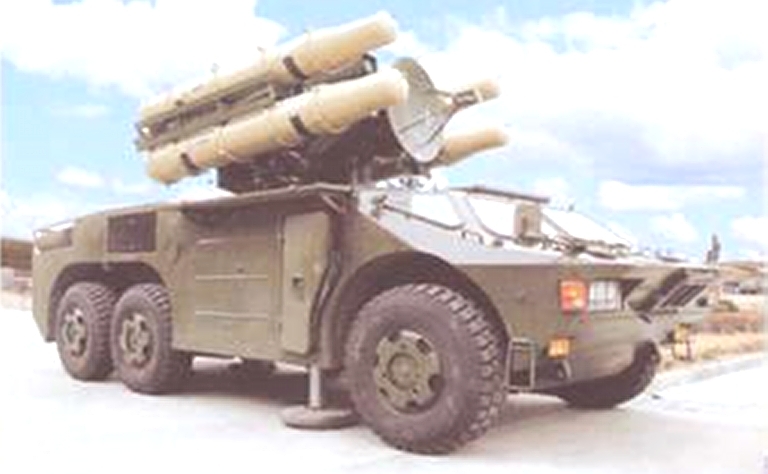 The vehicle was a transporter, launcher, and radar unit (TLAR) and its use was between the Russian 9K35 Strela-10 (SA-13 Gopher) and the 9K331 Tor (SA-15 Gauntlet) tracked surface-to-air missile systems. 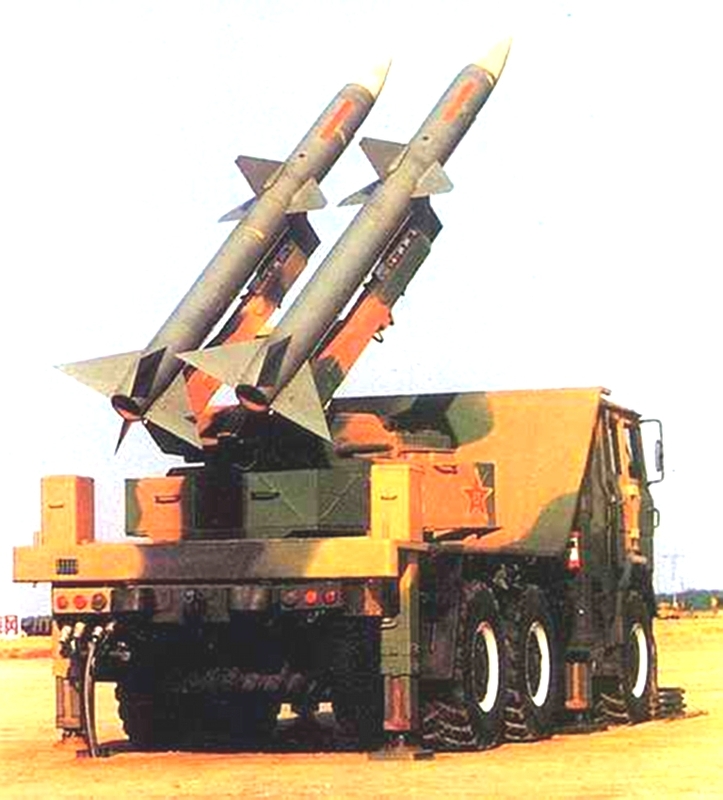 The WZ 551D carried a quadruple launcher, similar in shape to the then contemporary U.S. MIM-72A/M48 Chaparral surface-to-air missile (SAM) system which used an M54 missile launcher mounted on the M730 surface-to-air missile (SAM) system vehicle. Atop the launcher on the WZ551D was a search and acquisition radar which folded forward when not in use and for traveling to lower the vehicle’s silhouette. It appears to be a variant of the JY-17 series. The WZ551D was 6.65m long, 2.8m wide and had a height of 3.4m with the radar folded and 5m with the radar upright. It weighed 16t ready to fire with four missiles and a crew of between four and six. The prototype vehicle did not even have proper seating, with one seat a folding chair. The F8L413F 188kW four-stroke diesel engine gave it a power-to-weight ratio of 11.8kW/t, a top road speed of 85km/hr and a maximum range of 800km. It could surmount a 0.5 m vertical obstacle and wade through 1.2m of water. Its radar had a search radius of 20km at altitudes from 50 to 4000m with an electro-optical tracking system providing passive tracking and back up. Why it never entered service is unknown, but it could have been due to the changing nature of the threat and system itself. 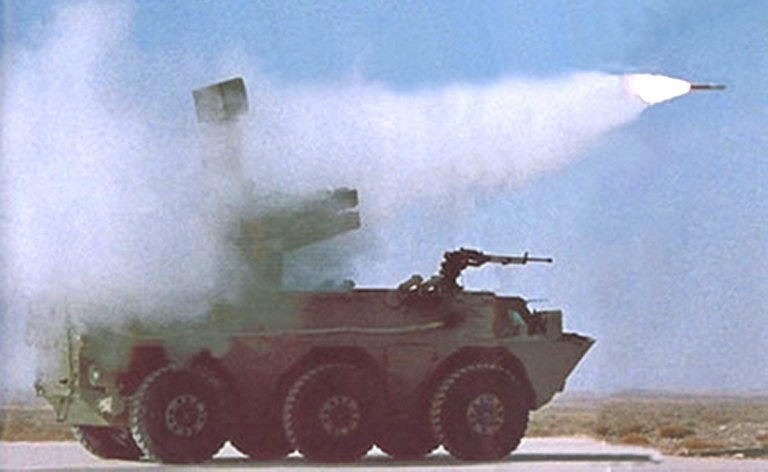 The WZ551D was designed to engage attack helicopters but the new fire and forget anti-tank guided missiles like Hellfire II have made many such surface-to-air missile systems obsolescent, as their silhouettes makes them readily identifiable and targeted by attacking aircraft, both fixed and rotary wing. 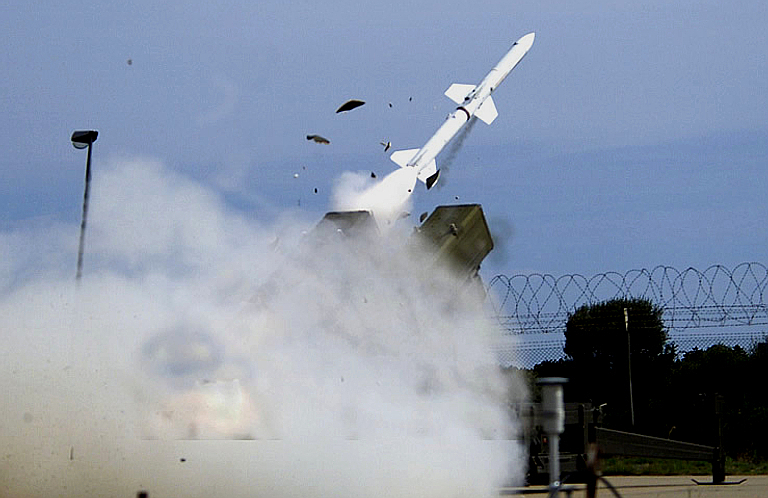 The PL-9 Air-To-Air Missile is used in this application as a Surface–To-Air Missile. It is an all aspect missile guided by a target’s thermal signature. Its surface-to-air variant weighs 120kg, is 2.99m long and like all the PL-9 versions has a diameter of 167mm, which compares favourably to the AIM-9 Sidewinder’s 127mm. 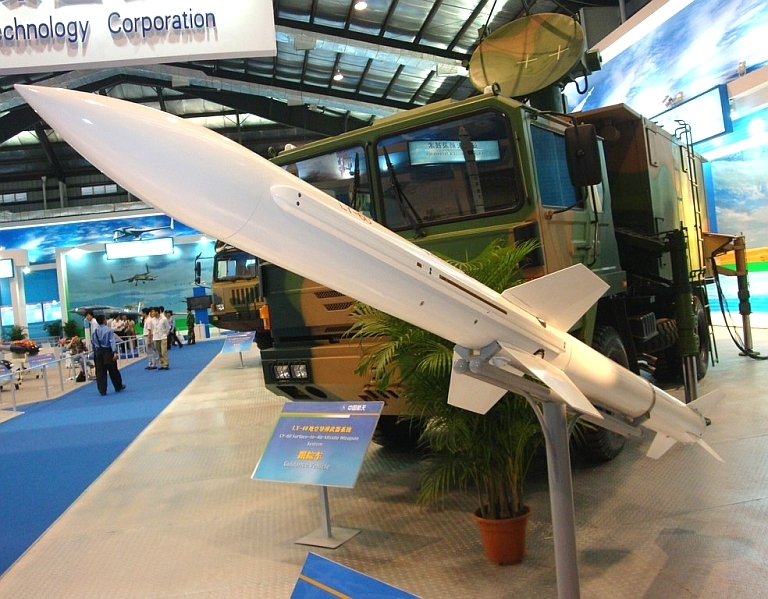 Its maximum speed is reported as Mach 2 and the version on the defunct WZ551D had a reported slant engagement range of 10km and could engage targets up to an altitude of 4,000 m.
Display model of the WZ551D point defence SAM system. 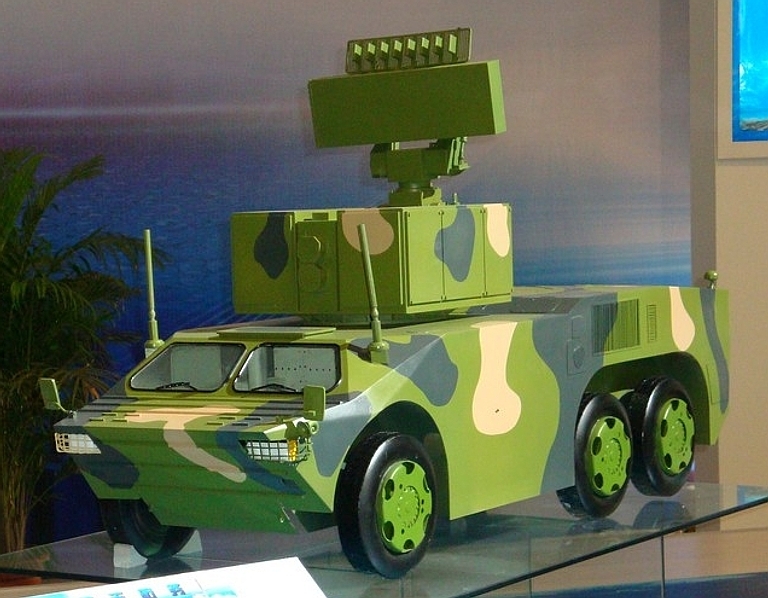 The Yi Tian wheeled self-propelled surface-to-air missile system uses the WMZ551 6x6 wheeled armoured fighting vehicle hull on which is mounted a surface-to-air missile comprising two square quad box launchers each containing a TY-90 short range short-range surface-to-air missile separated by the sensor system and mounting. The system comprises a CCD day/night sight, thermal imaging sight, laster range finder that elevate with the missile launchers. A top this is a mast mounted rotating planar array low probability of intercept (LPI) radar, designated the 825. The vehicle weighs 16 tons, has a crew of four and is armed with a remote controlled QZZ89 12.7 x 108mm heavy machine gun mounted forward on the right hand side of the roof next to the driver. 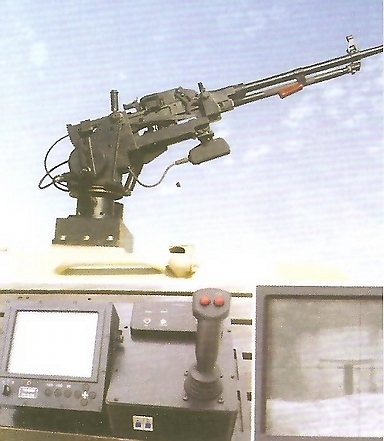 There is a small CCD optical sensor camera mounted under the gun cradle which is operated by a joystick inside the gunner’s position. There are four twin 76mm smoke dischargers mounted on the roof immediately, two mounted behind the machine gun and the driver’s hatch. The vehicle takes 30 seconds to prepare for firing from a cold start and two seconds to move which would assume the engine is running. 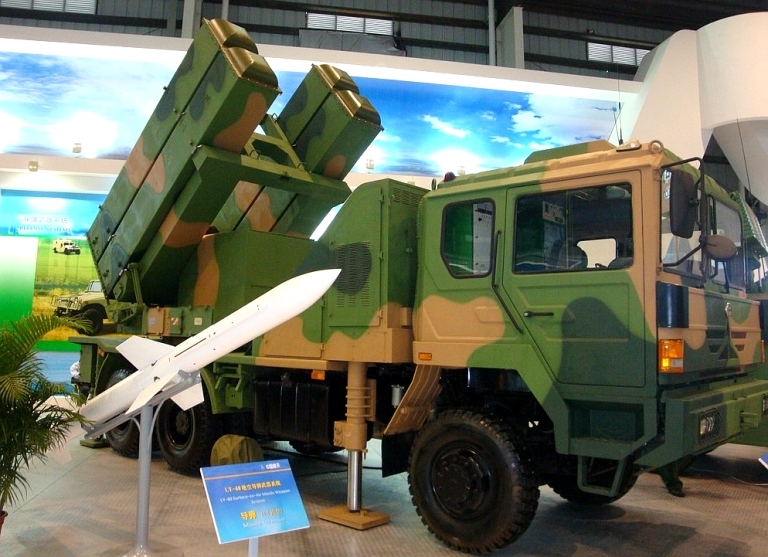 The Yi Tian Air Defence Battalion comprises a battalion headquarters and three self-supporting air defence companies. The battalion headquarters consists of a WZ551 armoured command vehicle 4x4 truck with a folding mast mounted IRIS-80 radar. For instance, the 113th Mechanised Infantry Division of the 38th Army Group is equipped with both Type 92 and 92A wheeled infantry fighting vehicles. 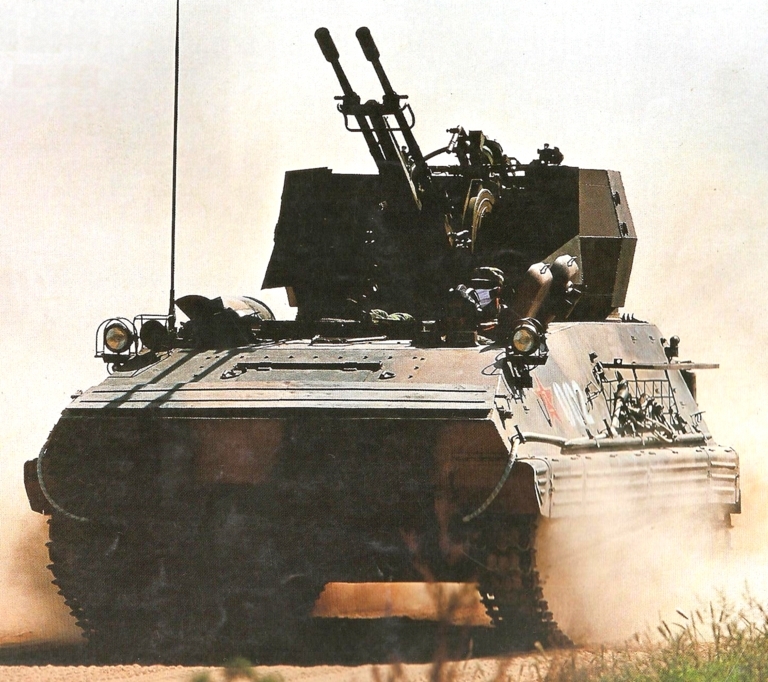 Other vehicles based on the chassis include command, anti-tank with the Hong Jia-8 ATGW, the Yi-Tian self propelled SAM system and the wheeled 122mm self-propelled gun, the latter is at this time close to approval. 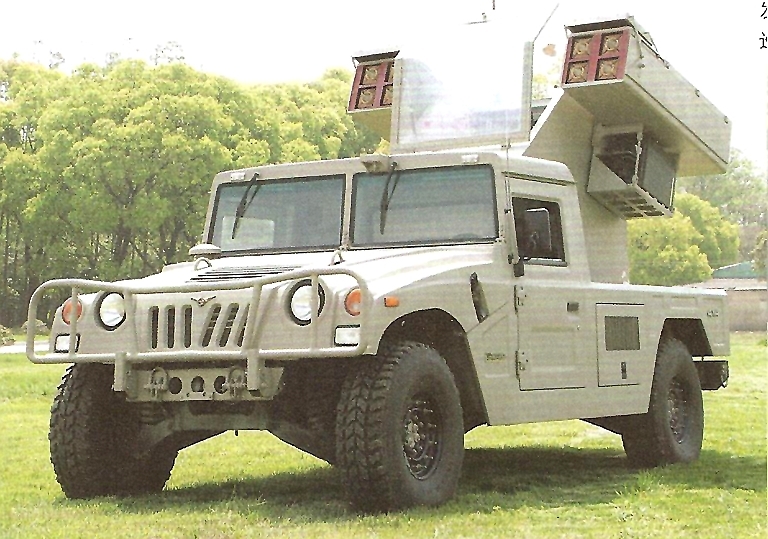 The air defence company headquarters comprises a single WZ551 ACV mounting a surveillance radar, six fire WZ551 air defence vehicles, two 4 x 4 resupply and two 4 x 4 maintenance trucks. Each company could spilt into two self-supporting groups (dui). Whether the company is organised into two vehicle platoons (pei) or squads (bian) is not known. The Type 81 ACV is also designated the WZ701 and is based on the Type 63 and uses the same extended hull as the WZ750 ambulance. The vehicle weighs 13 tons loaded for combat and contains seating for two crew forward of the rear and up to eight personnel in the rear. This makes for a crowded vehicle which includes a seat against the rear door and normally the personnel in the rear varies from 3 to 5. A battery fire control vehicle would have less personnel for example. 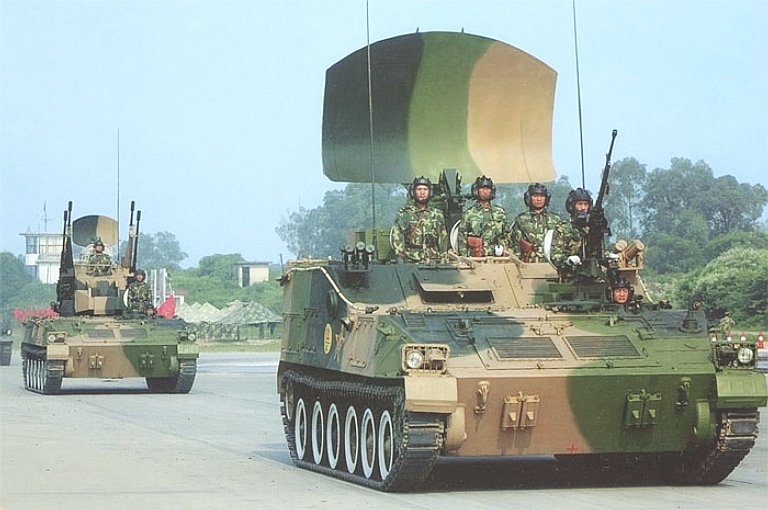 The Chinese ACV version in the article was equipped with five Type A-220 short wave/FM radios, one Type 714B back pack radio and one Type 339 facsimile machine. 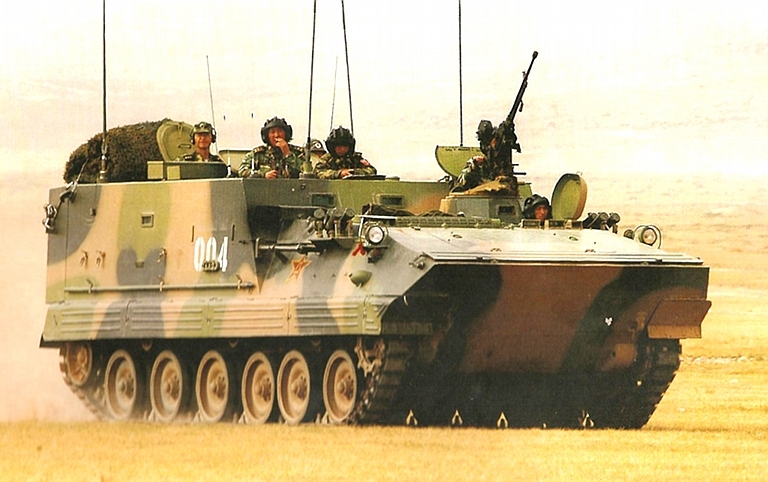 The Type 81 armoured command vehicle based on the Type 63 hull has had similar modifications to the Type 63C to enable it to provide command and control of amphibious landings. The PLAN modified version is designated the Type 81C. 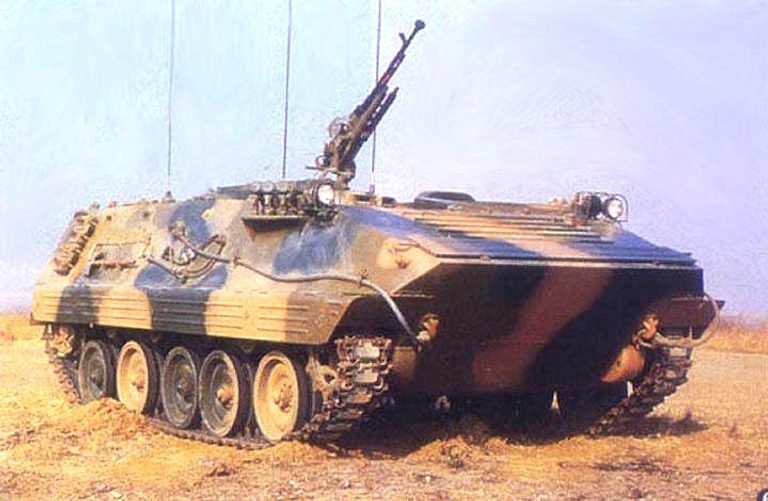 A Type 63 APC equipped with a ZU-23-2 3 mm AAA gun. 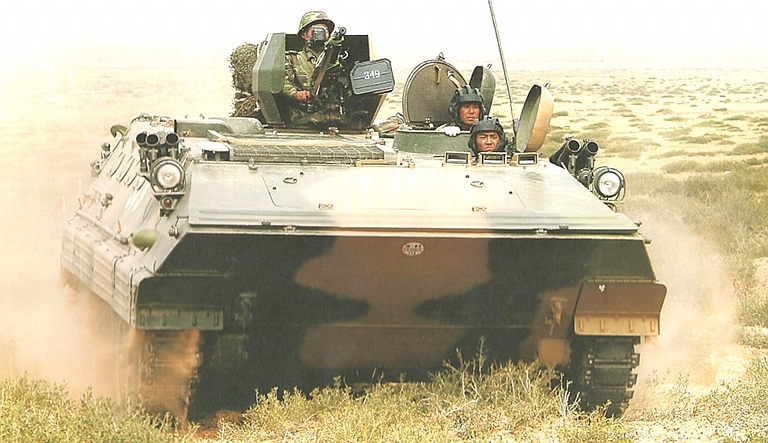 Unlike the Type 81 featured previously, this vehicle uses the same hull as the vehicle it is based on, in this case the Type 85 armoured personnel carrier. This means that the vehicle cannot be readily identified as an ACV on the battlefield drawing unwarranted attention, ACVs being natural ordnance magnets. The PLA has put into service a new armoured command vehicle based on the hull of the WZ752 armoured ambulance, itself based on the ZSD89 armoured personnel carrier. It has four large and two smaller whip antennae. The vehicle is 6,634mm long, 3,148mm wide and 2,470mm high to top of the hull. There four 76mm smoke grenade dischargers on both sides of the forward part of the hull. The vehicle commander/gunners sits behind the driver and he has a pintle mounted 12.7mm machine gun attached top his raised cupola. Type 89 ACV vs APC. Both equipped with a .50 cal weapon. The C2 version of the WZ551A transplants the rear of the Type 85 ACV on to the WZ551A hull. A typical ACV fit out is one VRC-83 and two VRC-84 transceivers and one 70-2B facsimile machine. The vehicle is quite high which would affect its cross-country ability and speed restrictions on turning at speed even on roads. Its height also makes it prominent on the battlefield, but as a rear area vehicle it will hopefully out of sight of surveillance and targeting systems. 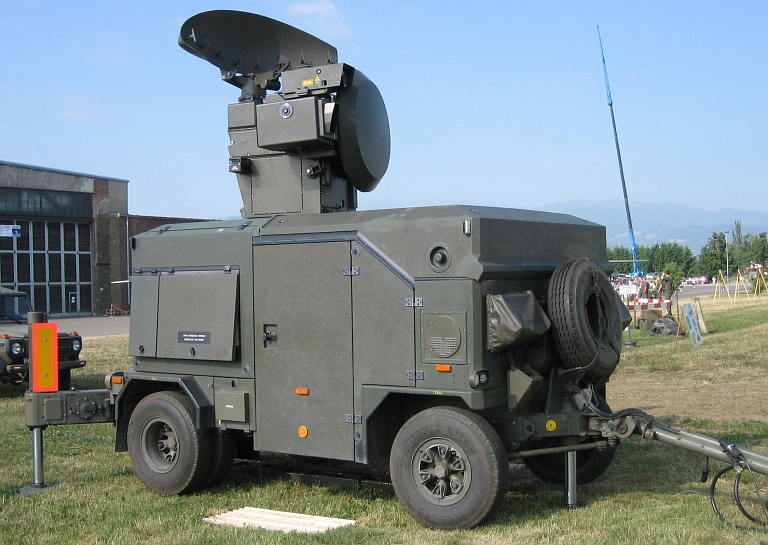 The ZZM-88 is an armoured cryptographic and communications centre vehicle for units equipped with vehicle mounted and back pack frequency hopping and later radio sets. It has two roles. Firstly, it provides remote re-keying of cryptographic protection, or daily keys, for frequency hopping radio sets automatically via radio transmission. The second is providing command and control nets using packet switching for higher level headquarters units. It is co-located with the highest level command vehicle to provide cryptographic and communications support. At the air defence headquarters it can provide dedicated secure real time nets for fire control, data linking and communications. The vehicle is equipped with a, VRC-8000 vehicle mounted radio, a PRC-18 back pack radio, a Z/TCP-1 rapid battery recharger, VIC internal communications system, one single voice (broadcast) system which could be used for the crypto keys, four two voice communications systems, one three voice communications system and one separate radio remote control internal main vehicle intercom. The FJ-10/2-2 crew environmental control system keeps the internal temperature of the vehicle habitable for the six crew, even when outside it is 45 degrees Celsius. The ZZM-88 was introduced in 1992 initially to units operating the then new Type 79 main battle tank which introduced the VRC-8000 radio into PLA service. 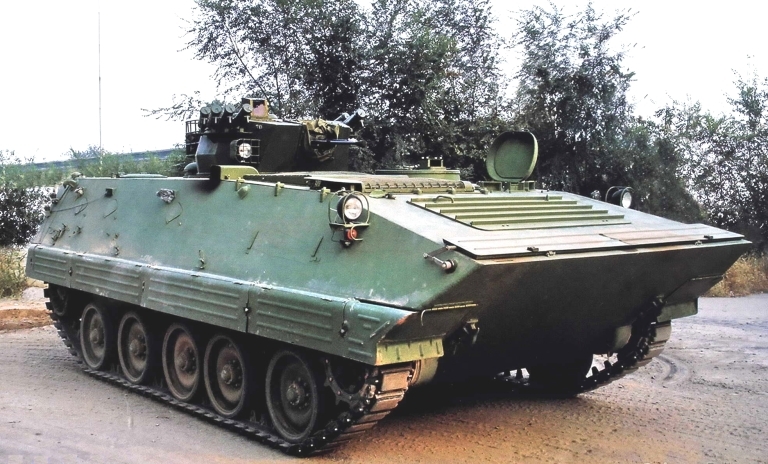 The vehicle would be co-located with a Type 81 armoured command vehicle to provide higher echelon units with a battlefield command and control net, and utilises the same hull as the Type 81 armoured command vehicle. Combat loaded it weighs 12.9t and is 5.576m long., 2.978m wide and 2.187m high including the sight on the Type 59 12.7 x 108mm heavy machine gun, with a hull height of 2.198m. The ground clearance is 435mm and it is powered by a 190kW diesel engine which gives a maximum ground speed of 61km/hr, a torque of 56.7kP and a maximum speed in water of 6km/hr. The vehicle has a maximum road range of 500km, 61km in water and 420 rounds of 12.7 x 108mm ammunition carried for the machine gun. 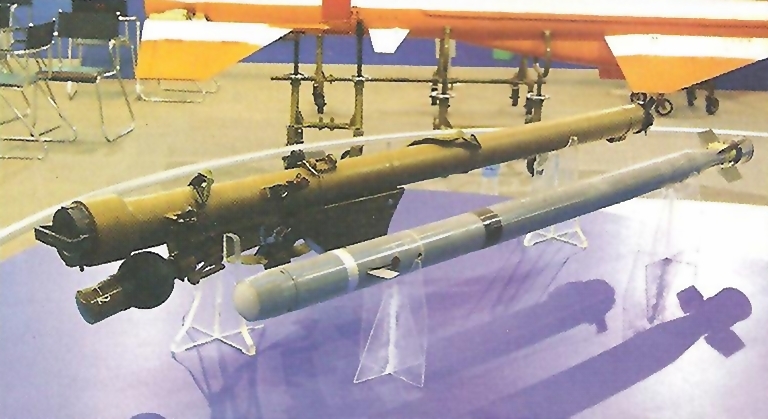 The QW-2 is a reverse engineered copy of the Russian 9K310 Igla-1 (SA-16 Gimlet). The infrared seeking missile is 72mm in diameter is 1.59m long and weighs 11kg. It has a launch speed of 25 m/sec and can engage a target at a distance between 500m to 6,000m at an altitude from 10m to 4,000m. All up, the system weighs 18.4kg and has a shelf life of ten years. In action, the reaction time is five seconds with a reported 75% chance of intercepting a target. 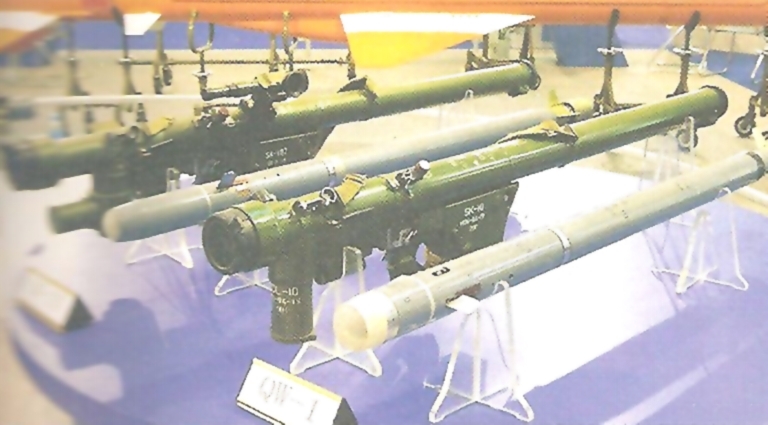 QW-1 and QW-1M MANPADS are predecessor variants to the QW-2 series. The HY/FN-6 is an infrared seeking missile with a diameter of 71mm, a length of 1.495m and a weight of 10.77kg. All up with the launcher the system weighs 17kg and can intercept a target going 600m/sec. The launcher can be equipped with a night sight and an IFF system similar to the AN/PPX-1 fitted to the FIM-92 Stinger. The FN-16 an improved version of the FN-6 and is also an infrared seeking missile with the missile having a diameter of 72mm, a length of 1.6m and can do an 18g turn. The FN-16 can engage a target flying between 10 and 4000m altitude up to up a range of 3km although the missile has a lethal range of 6km. weight of 10.77kg. All up with the launcher the system weighs 18kg, is 1.7m long and can intercept a target going 600m/sec. The People’s Liberation Army describes all heavy calibre machine guns as ‘high-angle’ weapons, following the Soviet convention of labeling air defence weapons as “Zenitniye”. 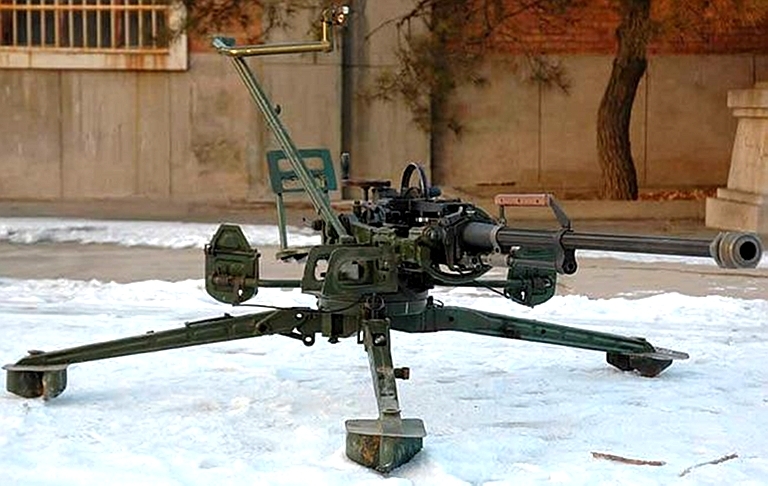 China has developed a lightweight 14.5mm anti-aircraft machine gun designated the QJG02. The weapon is designed to replace the Type 56 copy of the Russian ZPU-1 that comes in at 413kg. Despite a double baffle muzzle brake, the weapon would jump around on fully automatic fire. This is not unlike firing a .50 M-2 Browning on a hard surface. The weapon would have been very handy for the Mujahideen during the Russian invasion of Afghanistan but has been rendered obsolescent at best by MANPADS. This weapon remains nevertheless effective against rotary wing aircraft and low flying transports. Once broken down into six man portable loads, the heaviest weight is less than 20kg. It has a rate of 600rpm and an effective range of 2,000m; however its effective rate of fire is 100rpm. It was introduced with two new 14.5 x 114mm rounds, the DGJ02 APDS-T and the DGE02 APHEI-T. 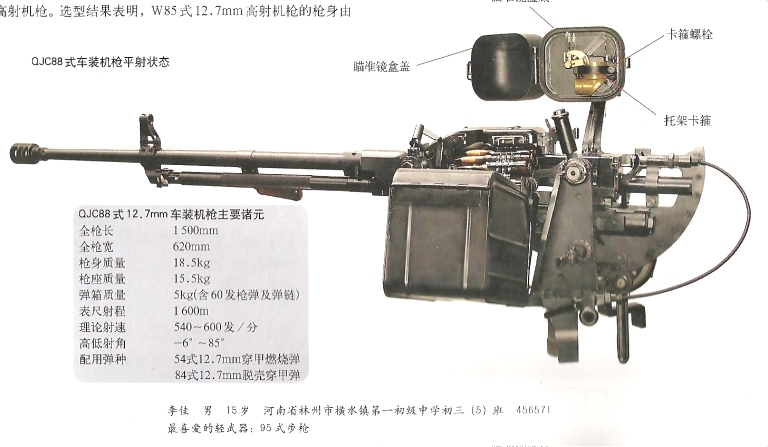 The Chinese Defence Industries are now offering the W95 12.7mm heavy machine gun in 12.7mm x 99mm, based on the PLA’s W85 heavy machine gun in 12.7mm x 108mm. The gun itself weighs 28 kg without the tripod and is 2050mm long overall. The heavy barrel, the rear half which is heavily fluted, is 1002mm long and the weapon has a cyclic rate of fire of 650-750 rounds per minute and an effective rate of fire of 80 – 100 rounds per minute. It is designed to operate in temperatures from -150C to 700C. Representing another doomed attempt to replace the M2 Browning heavy machine gun, it will probably be offered to Third World countries that are under a U.S. embargo against the supply of spare parts for their M2 Browning heavy machine guns. Given the popularity and numbers of M2s in the world, spare parts are readily available from many suppliers, and this is a forlorn hope. Some may be bought by countries in an attempt to spite the United States but the numbers would be small. 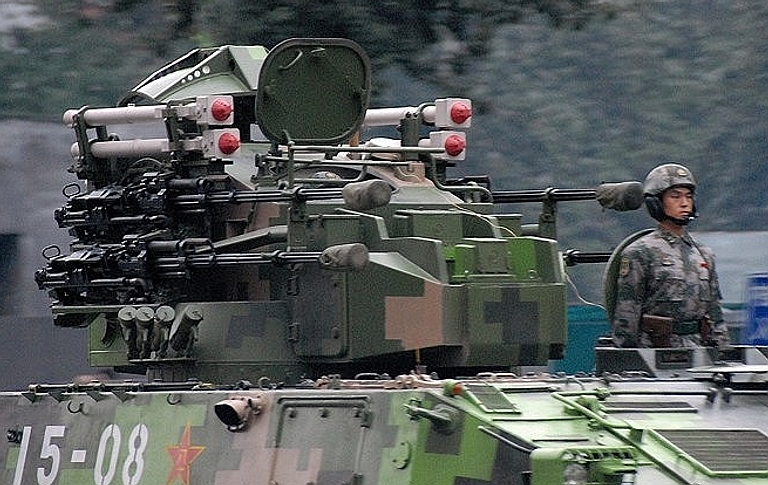 The Type 77 was developed further and entered into PLA service as the QJZ89 12.7 x 108mm heavy machine gun. The QJZ89 weighs 17.8kg empty and its simple tripod weighing 8.5 kg yields a total weight of 26.3 kg. The weapon’s overall length is 1,640mm with barrel length being 1003mm. The muzzle velocity is quoted at 825m/sec and the effective range 1,500 m. A 50 round drum feeds from the left. 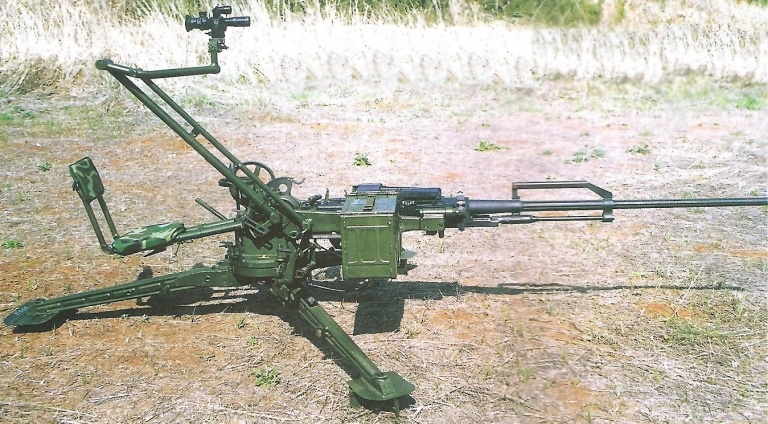 The new cupola mounted anti-aircraft machine gun is 1500mm long and 620mm wide. It comes in two parts, the main body weighs 18.5kg and the mount is 15.5 kg. Its elevation ranges from -60 to +850 and has a rate of fire of 540 to 600 rounds per minute. 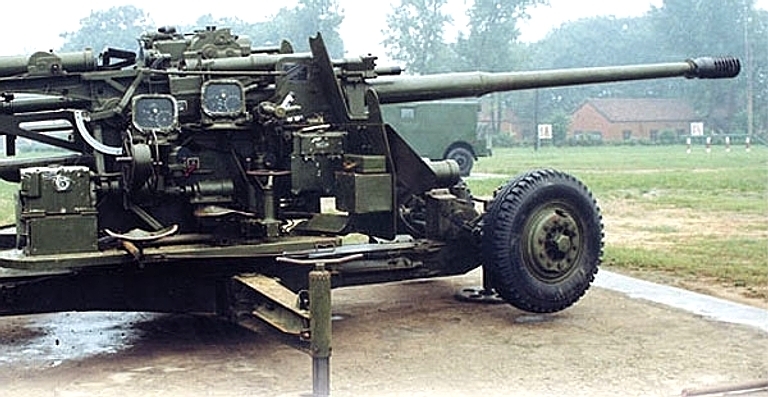 It can fire the Type 54 12.7mm family of cartridges and the Type 84 12.7mm APDS cartridge. 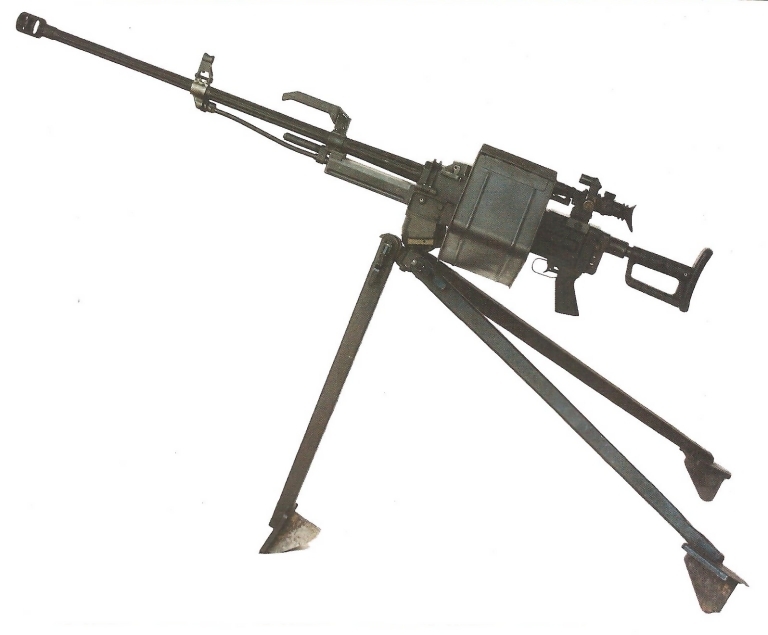 The Type 85 12.7 x 108mm heavy machine gun is a “product improved” version of the Type 77, and is as simple a design as a 12.7mm machine can be. With the tripod laid flat, the Type 85 is 2050mm long and 1160mm wide. It has a rate of fire of 650 – 750 rpm and depending on the tripod’s configuration (it can be set up for anti-aircraft fire) its elevation is from -10 to + 800 and an arc of 3600. The complete system weighs 39.6kg with its box magazine on the left hand side holding sixty rounds of link ammunition. 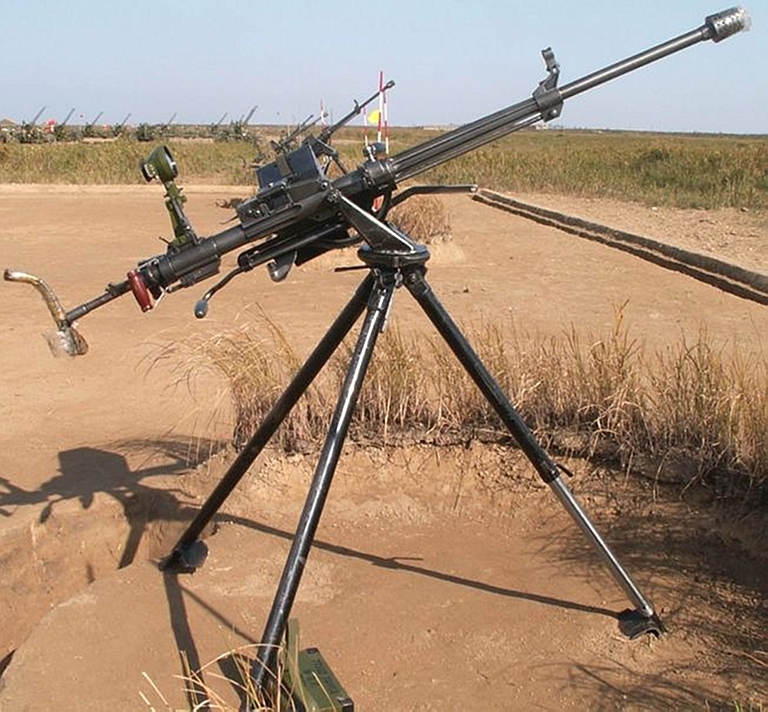 The Model 77 heavy machine gun is described as China’s first generation designed 12.7mm anti-aircraft machine gun. The Type 85 is a “product improved” version. The weapon is both gas (three settings) and recoil operated. The ammunition belt is the standard DShK metal non-disintegrating link. The gun itself weighs 21.3 kg, the tripod is 28.3kg and other attachments/accessories weigh 6.5kg, for a total weight of 56.1kg. The rate-of-fire is between 650 to 750 RPM, its range against aircraft is 1,600m slant and up to an altitude of 800m. The muzzle velocity is between 810 to 825m/sec and its maximum ground range is 7 km. 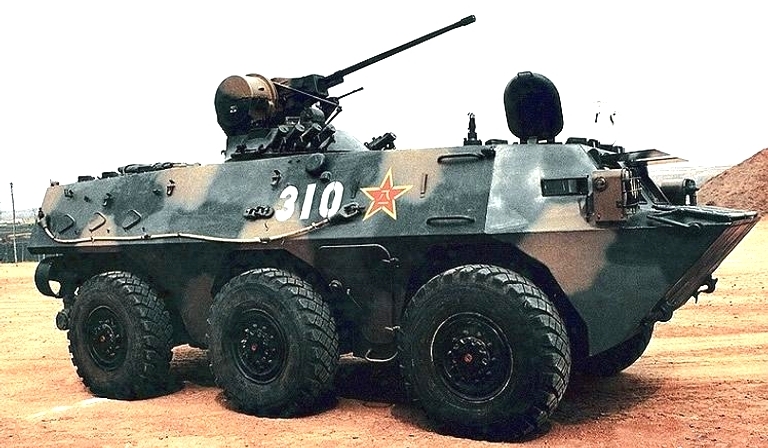 A copy of the Russian ZPU-2, the Type 58 twin 14.5 x 114mm anti-aircraft gun system provided Chinese units a small self-contained mobile system able to be set up almost anywhere. The weapon swivels on its integral circular mounting and has a single towing trail. Its two wheels rotate upwards on their axles to provide a stable firing platform. In traveling configuration, it was 3.900m long by 1.6m wide by 1.5 m high with guns in a horizontal position. Ready to it was 3.9m long, by 1.6m wide by 1.1m high. Its two magazines could each hold 150 round of ammunition in non-disintegrating link belts, weighed 42kg, and fully loaded for combat the Type 56 weighed 1,000kg with 600 rounds of ammunition.. Each gun fired at 600 rpm giving a total firepower of 1,200 rpm. In the anti-aircraft role its effective slant range is given as 1,000m and a 2,000m effective ceiling. 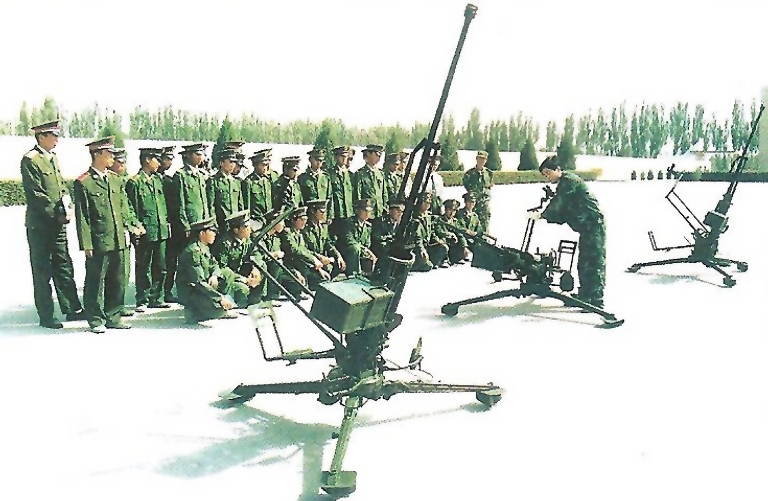 A copy of the Russian ZPU-4, the Type 56 quad 14.5 x 114mm anti-aircraft gun system provided Chinese units and fixed sites a high firepower powerful and light anti-aircraft system. On a small four-wheel mount, the equipment could be towed behind a light vehicle. To permit accurate firing the two side stabilisers swung out, the wheels swung upwards and the jacks screwed down so the ordnance sat on cruciform shaped mount. In traveling configuration, it was 5.545m long by 1.86m wide by 2.3 m high with guns in a horizontal position. Ready to it was 4.33m long, by 2.68m wide by 1.97m high. In an emergency, it could be fired in the traveling position. Its four magazines could each hold 150 round of ammunition in non-disintegrating link belts, weighed 42kg, and fully loaded for combat the Type 56 weighed 2,150kg. Each gun fired at 600 rpm giving a total firepower of 2,400 rpm. In the anti-aircraft role its effective slant range is given as 1,000m and a 2,000m effective ceiling. Type 56 high shooting machine gun shun dan (translates as twinkling & sudden and violent) round (14.5 x 114mm FMJ) with a white tip. This is an explosive that gives off a bright flash upon detonation. Obviously it can also be used as a ranging round. 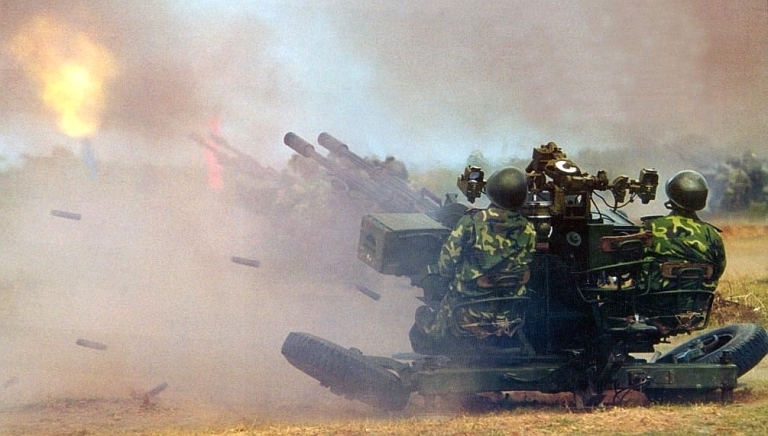 Used in the Type 54, 77 and 85 heavy machine guns, the cartridge and weapons are generally used in the air defence role. 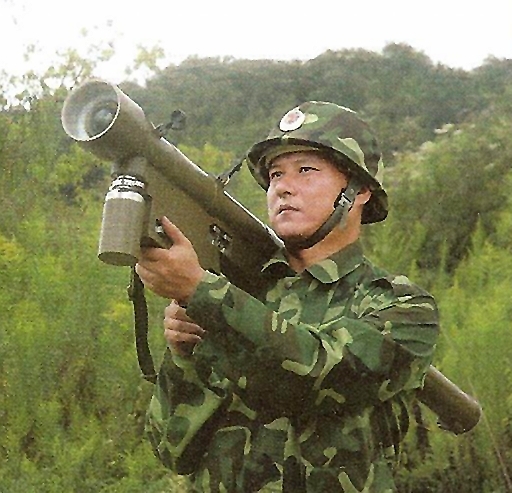 The primary cartridges in Chinese service are the armour piercing incendiary; armour piercing incendiary – tracer, and armour piercing discarding sabot. The API cartridge uses a copper jacketed lead sheathed steel core projectile with the incendiary compound in the projectile’s rear. It can vary in weight from 116 to 126g, and from 145.5 to 147mm in length. Its muzzle velocity is between 810 and 825m/s and the chamber pressure id 294.3MPa. At 100m it has a not less than 90% average of penetrating 20mm of steel plate set at 200; and at 70m can penetrate 15mm of steel plate with a not less than 80% chance of the incendiary compound igniting. The API-T cartridge uses a copper jacketed lead sheathed steel core projectile with the incendiary compound in the rear and the tracer compound behind that. It can vary in weight from 112 grams upward. Its muzzle velocity is between 810 and 825m/s and the chamber pressure is 294.3MPa. At 100m it has a 90% probability of penetrating 15mm of steel plate set at 450; and at 70m can penetrate 15mm of steel plate with a not less than 80% probability of the incendiary compound igniting. The APDS incendiary projectile uses a tungsten penetrator inside a sabot. The cartridge weighs between 98.7 to 108.7g and its velocity at 25m is 1,150m/sec. Its chamber pressure is 326.3MPa and at 100m, against a 15mm steel plate set at 450 has an average penetration rate of not less than 60%. The DVD06 12.7mm shuandtoudan (dual projectile round) is 146 to 147mm long and the cartridge has a total weight of 140g. The first round weighs 32g and has a muzzle velocity of 750 m/s and the second weighs 36g and has a muzzle velocity of 700 m/s. The chamber pressure is 294 MPa and at 300m the projectiles have a 50% mean point of impact group of 45cm. They can penetrate 20mm of homogenous steel plate at 100m (hardness not given) and 7mm at 1,000m. They can be identified by two crimp dents behind the cartridge shoulder and has an elongated projectile when compared to standard 12.7 x 108mm cartridges. The cartridge can be used in the Type 85, 88 and 89 12.7 x 108mm heavy machine guns. 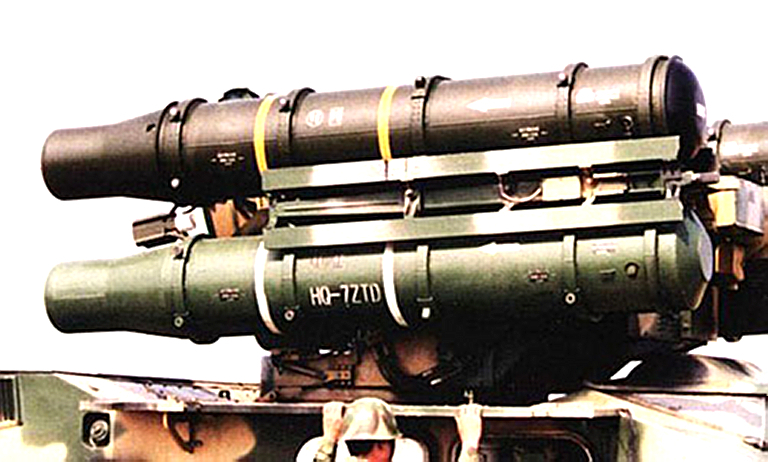 There are 12.7 x 108mm cartridges used in helicopter pylon pod mounted solenoid fired 12.7mm machine guns. These are the DVY 89 shi chuanjia ranshao yeguang dan (armour piercing incendiary – tracer round) which is identified by a blue-grey/ultramarine tip on the copper jacketed projectile; and the DVB89 shi chuanjia baozhe ranshao dan (armour piercing explosive incendiary round) which is identified by a silver tip on the steel jacket projectile. The Type 54 has a planning range of 2,000m in air defence and 1,000m in ground defence. There are three major Type 96 cartridges in service, API, API-T and APDS. The API cartridge weighs between 175 to 188g, with the projectile itself weighing between 63 to 64.8g, and having a muzzle velocity of between 980 to 995 m/sec and a chamber pressure of 325MPa. Its success rate at penetrating a 20mm steel plate set at 200 was no less than 80% which was the same at 100m and the ignition of the incendiary compound was put at no less than 80%. The API-T cartridge has an overall length of between 154.5 to 156mm, weighs between 170 to 183g, with the projectile itself weighing between 58.2 to 61g, and having a muzzle velocity of between 995 to 1,015m/sec and a chamber pressure of 319MPa. Its success rate at penetrating a 20mm steel plate set at 200 was no less than 80% which was the same at 100m against a vertical 20mm steel plate and the ignition of the incendiary compound was put at no less than 80%. The tracer lasts over three seconds and burns out more than 2,000m. Using a tungsten core, this APDS cartridge, 98.7 between 108.7g and at 25m has a velocity of 1,150m/sec with a chamber pressure of 326.3MPa. The tungsten penetrator has a success rate of penetrating a 15mm plate set at 450 of no less than 60%. Introduced for use in the QJZ91 heavy machine gun which did not see service it can be described as the forerunner to the DGJ02 cartridge. It was 173mm long overall and had a weight range of between 98.7 and 108.7g, presumerably different designs were trialled. It had a velocity at 25m of 1,250m/sec and a chamber pressure of 355.7MPa. It had a success rate of no less than 80% in penetrating a 20mm steel plate set at 500 at 1,000m. The DGJ02 AP-T cartridge uses a 45g tungsten penetrator, wrapped in a discarding sabot with dual colour tracer to aid ranging. The sabot splits and leaves the penetrator between 150 to 200m from the muzzle. It has a muzzle velocity of 1,250m/sec and is quoted as being able to penetrate 20mm of armour plate set at an angle of 500 at 800m. The DGE02 APHEI cartridge weighs between 175 and 188g. At 800 m it is quoted as having a 90 percent chance of being able to penetrate 15mm of armour plate set at 300. At 300m after penetrating a 2mm soft steel plate (representing an aircraft skin) it can further penetrate a 1.2mm thick steel plate producing 20 fragments. Upon explosion between 75 and 95 incendiary pieces are formed which have an 80% chance of igniting aviation fuel. Developed for export, the M203 cartridge is identical in performance to the Type 56 14.5 x 114mm cartridge. The CS/BFD06 is a high-explosive incendiary cartridge built for export. It has a total weight of 180g, an overall length of 156mm with a muzzle velocity between 980 to 995m/sec and a chamber pressure of 319MPa. At 1500m it can penetrate 1.0mm of 08F steel then a 2mm aluminium plate with 90% success rate coinciding with an incendiary ignition success rate of also 90%. ‘Zhongguo zengqiang jixiehua bubing shi gonglji nengli’, Tanke zhangjia cheliang, 2006 Niandi, 11Qi, Zhongdi 249, pp. 12 – 15. ‘Wai kanbao dao Zhonnguo jianshe gengduo qingxing jixiehua budui’, Tanke zhangjia cheliang, 2008 Niandi, 1Qi, Zhongdi 263, pp. 26 – 28. ‘Zhongguo zengqiang jixiehua bubing shi gonglji nengli’, op. cit., pp. 12 – 15.
 . ‘China’s military exercise Vanguard-2008 concludes’, Xinhuanet, 28 October 2008, http://news.xinhuanet.com/english/2008-10/28/content_10269127.htm accessed 29 October 2008.
 . Baryatinskiy, Mikhail. ‘The Protectress of the Infantry’, M-Khobbi, 5/2005, Issue 63,pp. 18 & 19. ‘SA-2 Surface-to-Air Missile’, National Museum of the USAF, http://www.nationalmuseum.af.mil/factsheets/factsheet.asp?id=334, accessed 30 June 2008. ‘Xinxing biezhide guochen dierdai zhuangjia shusongche ___ Zhongguo zixing yanzide ZSD89 Shu ludai shi zhuangjia shusongche’, Tanke zhangjia cheliang, 2007 Niandi, 4 Qi, Zhongdi 254, pp. 5 – 11. ‘Zhongguo xinxing duikong zhuhai’, op.cit., p. 10. Also ‘Zhongguo xinxing duikong zhuhai’, Xiandai junshizao (CONMILIT), 2004 Niandi, 12 Qi, Zhongdi 335 Qi, pp. 11 & 13. p. 10; Zhongguo xinxing duikong zhuhai’. ‘Zhongguo FLV-1 jincheng qingxing chezai fangkong daodan wuqi xitong’, Bingqi Zhishi, 2004 Niandi, 7 Qi, Zhongdi 201 Qi, pp.12 – 15. 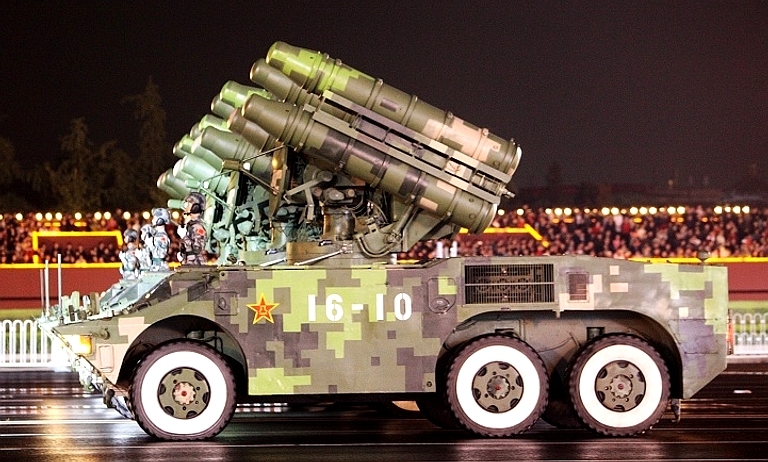 The title of the article translates as ‘ Chinese FLV-1 close in (near stage in journey) light type air defence missile weapons system’. ‘Zhongzhide fangkong weishi __ woguo yanzhide WZ551D lunshi zhuangzia dikong daodan fanshe che’, Tanke zhangjia cheliang, 2008 Niandi,5 Qi, Zhongdi 267, pp. 5 – 9; WZ554 zixing gaopao he WZ551D dikon daodan fashe, Tanke zhuangia cheling, 2002 Niandi, 12 Qi, Zhongdi 202 Qi, pp. 16 & 17.
 . ‘Zhongguo xinxing duikong zhuhai’, Xiandai junshizao (CONMILIT), 2004 Niandi, 12 Qi, Zhongdi 335 Qi, pp. 11 & 13.
. ‘Zhuanti QJG02 shi 14.5mm danguang gaoshshe jiqiang pouxi’, Qing Bingqi, 2005 Niandi, 2 Qi, Zhongdi 192 Qi, pp. 17 – 20.
 . Foss, C.F. Jane’s Armour and Artillery 1983-84, Jane’s Publishing Company, London, 1983, p. 698.
 . ‘(Yiran suoqianglong) guodong W95 shi 0.50 yingcu zhongjiqiang’, Bingqi Zhishi, 2/2007, Number 232, pp. 34 – 36. ‘Zhongguo QJZ89 shi 12.7mm zhongjiqiang’, Qing Bingqi, 2007 Niandi, 10 (xia) Qi, Zhongdi 257, photograph inside rear cover. ‘QJC 88 shi 12.7mm chezhuang jiqiang’, Qingbingqi, 2006 Niandi, 11Qi (shan), Zhongdi 234, pp. 16 – 19. ‘Zijiang benteng keji xingye ___ ji jiuliuwuliu chang’, Qingbingqi, 2007 Niandi, 6 (xia) Qi , Zhongdi 249, pp. 40 – 42. ‘Zijiang benteng keji xinye _ ji jiuhuoli chang’, Qingbingqi, 2007 Niandi, 6 (xia) Qi, Zhongdi 249, pp. 40 & 41; ‘Zhongguo gaoshe jiqiang “diyi” 77 shi 12.7mm gaishe jiqiang’, Qingbingqi, 2008 Niandi, 12 (xia) Qi, Zhongdi 285, pp. 16 – 20. Unless mentioned otherwise the information comes from ‘Yingzao dande shijie: Zhonnguo qiangdan jingguan (shang)’, Qing Bingqi, 2008 Niandi, 9 (xia) Qi, Zhongdi 279 Qi,.pp. 36 – 39. ‘Tudigemiong zhanzeng guochandan zhijie (xia)’, Qingbingqi, 2007 Niandi, 6 (shang) Qi , Zhongdi 248, pp. 16 – 18. ‘Zhongguo xinxing gaoxiaoneng wushi qidanyao ___ DVD06 shi 12.7mm shuangtoudan’, Qing Bingqi, Number 11/2007 (shang), Number 258, pages 36 & 37. ‘Zhongguo xinxing QJK99-12.7-1 xing hongkong jiqiang shejizhe’, Qing Bingqi, 2006 Niandi, 10(shang) Qi, Zhongdi 232 Qi,.pp. 11–14. ‘DGJ02 shi 14.5mm wuxin tuke chuanjie ranshao yeguangdan’, Qing Bingqi, 2005 Niandi, 2 Qi, Zhongdi 192 Qi, pp. 21 & 22; ‘DGE02 shi chuanjie baozha ranshao dan’, Qing Bingqi, 2005 Niandi, 2 Qi, Zhongdi 192 Qi, pp. 22 & 23. .‘DGJ02 shi 14.5mm wuxin tuke chuanjie ranshao yeguangdan’, Qing Bingqi, 2005 Niandi, 2 Qi, Zhongdi 192 Qi, pp. 21 & 22. ‘DGE02 shi chuanjie baozha ranshao dan’, Qing Bingqi, 2005 Niandi, 2 Qi, Zhongdi 192 Qi, pp. 22 & 23. See GI Zhou Newsletter Number 37 Page 2. Wujun dengbu zuozhande “Zhulijun” ___ Zhongguo 63C, 86B liangqi zhuangjia zhantou cheliang’, loc.cit. ‘Yunchou weiwo jueshi qianli (xia) ___ Zhongguo yanzhide jikuanludai shi zhuangjia zhihuiche’, Tanke zhangjia cheliang, 2006 Niandi, 5 Qi, Zhongdi 243, pp. 5 - 10. Andrew, Martin. 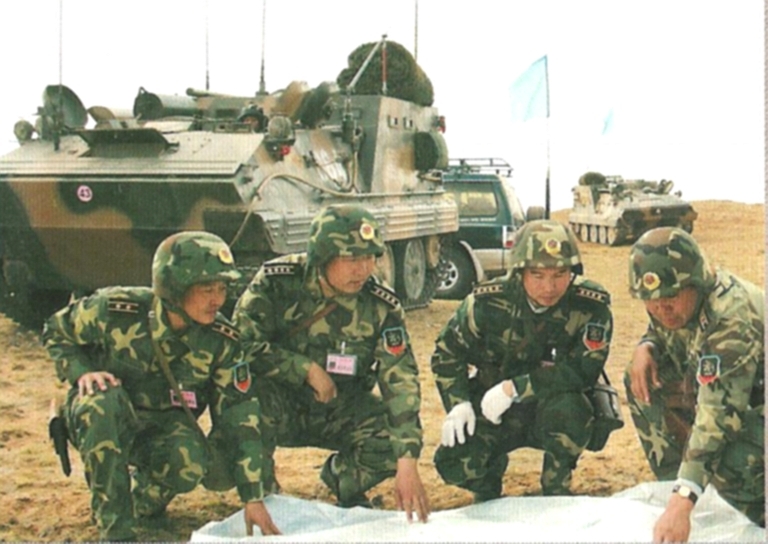 ‘Model 85 Armoured Command Vehicle’, GI Zhou Newsletter, Number 42, 11 August 2006, p. 2. Wise, John, C, Chinese Radars. ‘[Bachang jianxi yi zhangtain] “Yitian” fangkong daodan wuqi xitong’, Bingqi Zhishi, 2009, Niandi, 5A Qi, Zhongdi 268, pp. 24 – 26. ‘Zhongguo xinxing duikong zhuhai’, Xiandai junshizao (CONMILIT), 2004 Niandi, 12 Qi, Zhongdi 335 Qi, pp. 11 & 13. Also ‘09 abuzhabi fangwa zhangshangde Zhongguo bingqi’, op. cit., p. 22. ‘Zhuangjia zhanchede baomuibing __ Zhongguo ZZM88 xingludai shimiyao jiasheche’, Tanke zhuangjia cheliang, 2009 Niandi, 5 Qi, Zhongdi 283, pp. 5 - 10. ‘Hingse tiankong “Budan wang” ___ 56 xilian, 58 shuanglian, 14.5mm gaoshe jiqiang (xia)’, Qing Bingqi, 2007 Niandi, 12 (shang) Qi, Zhongdi 259, pp. 12 – 16. ‘Hingse tiankong “Budan wang” ___ 56 xilian, 58 shuanglian, 14.5mm gaoshe jiqiang (shang)’, Qing Bingqi, 2007 Niandi, 11 (xia) Qi, Zhongdi 259, pp. 20 – 24. ‘“Ludan”-2000 luji jincheng fangkong fadao wuqi xitong’, Bingqi Zhishi, 2010 Niandi, 4A Qi, Zhongdi 290 Qi, pp. 38 & 39. The Type 59 / KS-19 100 mm towed AAA gun. The Soviet S-60 57 mm towed AAA piece was cloned for use by PLA units (Wikipedia image). 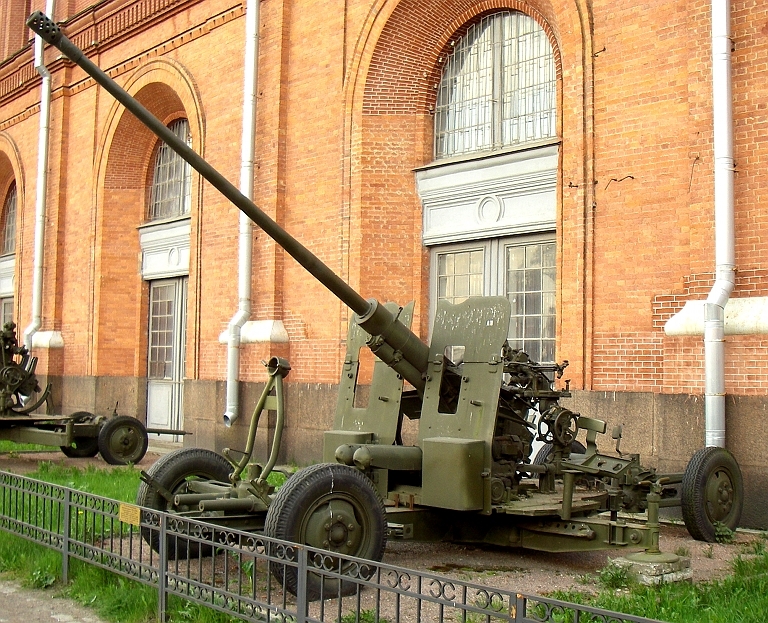 The Type 85 23 mm towed AAA piece was based on the Soviet ZU-23-2 and intended for export only.